The sticker on this bus, below the MTA logo, indicates that it belongs to the West Farms Depot. On June 1, 1940, the New York City Board of Transportation (BOT) took over the streetcar operations of the Brooklyn–Manhattan Transit Corporation (BMT), as part of the unification of the city's transit system under municipal operations. The streetcar lines would be motorized into diesel bus routes or trolleybus routes over the next two decades. In 1947, the BOT took over the North Shore Bus Company in Queens and Isle Transportation in Staten Island, giving the city control of the majority of surface transit in Brooklyn, Queens, and Staten Island. On September 24, 1948, the BOT took over the East Side Omnibus Corporation and Comprehensive Omnibus Corporation in Manhattan, receiving two depots in East Harlem. From 1947 to 1950, the BOT reconstructed numerous depots and trolley barns inherited from the private operators, and erected or purchased new facilities to expand capacity. In 1962, the New York City Transit Authority (successor to the BOT) and its subsidiary Manhattan and Bronx Surface Transit Operating Authority (MaBSTOA) took over the operations of the Fifth Avenue Coach Company in Manhattan and the Bronx. The Transit Authority inherited at least 12 bus depots from the company, some of which were kept in operation while others were condemned and closed. From 2005 to 2006, the remaining private operators were taken over by the MTA Bus Company. The MTA inherited eight facilities at this time, which had been built either by the companies or the New York City Department of Transportation (NYCDOT). The MTA has two major "central maintenance facilities" (CMFs) that serve the New York City area. The Grand Avenue Central Maintenance Facility is adjacent to the Grand Avenue Depot in Maspeth, Queens, and the Zerega Avenue Central Maintenance Facility is located at 750 Zerega Avenue in the Bronx. Both maintenance facilities are responsible for the major reconstruction of buses in need of repair including engine rebuilding, transmission shops, and shops for body components on New York City Transit Authority's bus fleet, as well as repainting of buses. The facilities also include several employee workshops for surface transportation training and institutional instruction. In addition, Zerega Avenue CMF is responsible for registry of new buses in the fleet. The two facilities were conceived as part of the 1995-1999 and 2000-2004 MTA Capital Programs. The Zerega Avenue facility was opened in 2001, while the Grand Avenue facility was opened in 2007 along with the bus depot. Previously, the large repair shops of the East New York Depot served as the system's sole central maintenance shops; as of May 2016, East New York is considered a third central maintenance facility. The Zerega Avenue Maintenance and Training Facility is a one-story structure located on the east side of Zerega Avenue between Lafayette and Seward Avenues in the Castle Hill section of the Bronx, sitting along the western coast of Westchester Creek. Plans for the facility were conceived around 1999, and it was constructed in 2000. The facility received an award from the American Society of Civil Engineers for design-build project of the year in 2002. Around 2002, the Zerega shops began overhauling NYCT buses to operate on ultra-low-sulfur diesel. The facility includes paint booths for MTA buses, and was designed to maintain compressed natural gas (CNG) equipment. It also features numerous classrooms and a driving simulator to train MTA bus operators. The Manhattan and Bronx Surface Transit Operating Authority (MaBSTOA), a subsidiary of the New York City Transit brand, operates all the local routes in the Bronx except the Bx23 and the Q50 local routes and BxM express routes. Those routes are operated under the MTA Bus Company brand. All Bronx bus depots (including those under the MTA Bus Company) are represented by TWU Local 100. Several Orion V buses at the Eastchester Depot. The Eastchester Depot is located on Tillotson Avenue near Conner Street, near the Co-op City neighborhood, and off the New England Thruway (Interstate 95) in the Eastchester neighborhood of the Bronx, New York. It was built in 1970, and is owned by Edward Arrigoni, former president of New York Bus Service, and has been leased to the City of New York and MTA Bus Company for twenty years with an option to purchase afterwards. It was renamed Eastchester Depot upon takeover on July 1, 2005. It previously housed the mass transit operations of NYBS, which only operated express service from the Bronx to Manhattan, as well as its school bus operations. This depot contains a major bus overhaul and repair facility/shop for various type of buses, a major "reserve storage" facility for out-of-service buses, and a storage facility for decommissioned and wrecked buses awaiting scrapping. The latter set of buses are stripped of usable parts such as windows and engine components, as well as reusable fluids such as motor oil and fuel, before the remaining shells and unsalvageable parts are sold for scrap. The scrapping program began in summer 2008. Under the MTA, the shop was upgraded with a new concrete floor. The facility underwent further renovations in the 2010s, replacing the maintenance building's roof and improving ventilation and pollution controls including containment of fuel spills. The upgraded facility opened on August 13, 2015. Local Routes: Bx23, Q50. These two routes were split from the former Queens Surface route, the QBx1, in 2010; the Q50 used to operate from the former Queens Surface depot in College Point. Express Routes: BxM6, BxM7, BxM8, BxM9 (shared with College Point), BxM10. All these routes had been NYBS routes. The Gun Hill Depot is located at 1910 Bartow Avenue, near Gun Hill Road, just west of the New England Thruway (I-95) in Baychester, Bronx, and near the Co-Op City neighborhood, which a number of routes serve. Prior to the construction of the depot, the site was a garbage dump and toxic waste dump, used at various times for both legal and illegal waste disposal. It was selected by the MTA for a new garage in 1979, in order to replace the original West Farms Depot. It opened on September 10, 1989, replacing the old Kingsbridge Depot which was closed the same day awaiting demolition, rebuilding and reconstruction. In 1992, the MTA built little league baseball fields on an adjacent site one block west. The MTA also owned the lot immediately south of the depot until 2014, which was leased and used as a driving range from 1999 to 2010. This land was originally planned for an expansion of the depot, or a new central rebuild facility. The depot also contains heavy maintenance facilities, and served the Bronx's central maintenance facility upon opening, replacing the former West Farms Depot. The Kingsbridge Depot is located in the block bounded by Ninth Avenue, Tenth Avenue, 216th Street, and 218th Street in Inwood, Manhattan, two blocks north of the New York City Subway's 207th Street Yard. The depot was built as the Kingsbridge Car Barn, a streetcar barn owned by the Third Avenue Railway in 1897. This barn, located on the west side of Ninth Avenue, was a one-story brick structure with a basement and steel frame. It was designed in Roman renaissance style with terracotta features. Among its designers included Isaac A. Hopper, who constructed Carnegie Hall. Across from the barn on the east side of Ninth Avenue was the Kingsbridge Power House, which was constructed around the same time and supplied electricity to the Third Avenue system. It was designed and built by Westinghouse Electric Corporation and by Hopper, with similar brick and terracotta features. The facility became the location of the company's central repair shop in 1947, when the 65th Street Shops closed. In 1948, Third Avenue's central repair shop was moved again to a facility in Yonkers, while the Kingsbridge Depot ceased serving trolleys and began serving buses in 1948. In 1962, it was acquired by the MaBSTOA. The original 1897 depot closed on September 10, 1989 when the Gun Hill Depot opened, and was razed soon after. The depot had fallen into disrepair, while the placement of its support columns was inconvenient for buses as opposed to streetcars. The current Kingsbridge Depot, opened on February 23, 1993, consists of two separate buildings: one for maintenance (the Ninth Avenue Shop) and one for bus storage. The Ninth Avenue shop rebuilds individual bus components. The depot was built to house 242 buses. It was the first in the city to house articulated buses beginning on September 30, 1996. West Farms Depot in the Bronx, with Orion VII CNG exiting. The West Farms Depot is located along East 177th Street and next to the north end of the Sheridan Expressway at its interchange with the Cross Bronx Expressway, in the West Farms section of the Bronx. The site is bounded by 177th Street at its north end, Devoe Avenue to the west, and is just south of East Tremont Avenue (also called Hector Lavoe Boulevard) and West Farms Square. The depot opened on September 7, 2003 on the site of the former Coliseum Depot. It is one of five compressed natural gas (CNG) Depots in the Buses system, along with Jackie Gleason, Spring Creek, Zerega, and College Point facilities and formerly Rockvile Centre and Mitchel Field depots (now NICE bus depots under the same name) . Original the site was an amusement park called Starlight Park, which hosted the Bronx International Exposition of Science, Arts and Industries in 1918. In 1928, the park operators received the auditorium from the 1926 Sesquicentennial Exposition in Philadelphia, which became the New York Coliseum. The coliseum and park went into receivership in 1940, and the coliseum was used as a vehicle maintenance center for the United States Army during World War II. It was acquired by the Third Avenue Railway in April 1946, and was converted into a bus depot and repair shop for the successor Surface Transportation Corporation around 1950. The company also operated a second facility nearby, at what is now West Farms Road and the Cross Bronx Expressway. Surface Transit was taken over by New York City Omnibus Corporation in 1956, and the depot became municipally operated when its parent company Fifth Avenue Coach folded in 1962. The Coliseum Depot closed in 1995 and was demolished in 1997, while a new CNG-compatible facility was constructed as part of the MTA's 1995-1999 Capital Program. This included a "fast-fill" CNG filling station at the cost of $7.3 million. It became the second NYCT depot to facilitate CNG when it opened in 2003. The Yonkers Depot is located at 59 Babcock Place at the foot of Alexander Street in the Getty Square section of Yonkers, New York, near the facilities of Greyston Bakery. The site was initially a freight yard for the adjacent Hudson Line, used by the New York Central Railroad. The depot was originally built for Riverdale Transit Corp, which later became a part of the Liberty Lines Express system. It is currently owned by New York City and leased to MTA Bus Company, sold by Liberty Lines on January 3, 2005 for $10.5 million. The depot consists of an administration building, a shop for bus maintenance and repairs, and an outdoor parking lot used for storing 80 express buses. The buses from the depot provide express service between Yonkers or Western Bronx and Manhattan. The city of Yonkers plans to acquire at least a portion of the site from the MTA, as part of the redevelopment of the waterfront area, a former industrial section. This depot houses the buses used on the BxM1, BxM2, BxM3, BxM4, BxM11 and BxM18 express routes. All Brooklyn local and Brooklyn express routes are operated by either the New York City Transit brand or the MTA Bus brand, although most are branded with the former; only the B100 and B103 local routes, and the BM- express routes, are operated by MTA Bus. All Brooklyn NYCT depots are represented by TWU local 100. Spring Creek Depot, operated under the MTA Bus Company, is now represented by TWU local 101, which replaced ATU local 1181 in early 2018. The East New York Depot, also called the East New York Base Shops, is located at One Jamaica Avenue/25 Jamaica Avenue at Bushwick Avenue in the Broadway Junction area of East New York, Brooklyn, just east of the New York City Subway's East New York Yard. The five-story structure is steel-framed with a brick exterior, with two stories for bus storage and repair shops. The facility was built to perform heavy maintenance, and served as New York City Bus' central maintenance facility until the opening of the Zerega and Grand Avenue facilities. Buses enter and exit the complex via numerous doors on Jamaica Avenue, with an additional vehicle entrance at the north end of the complex at Bushwick Avenue. The depot was built to house over 300 buses. It currently has space for around 280 buses, including two additional outdoor parking lots south of the depot: Havens Lot at Havens Place between Herkimer Street and Atlantic Avenue, and Herkimer Lot at Herkimer Street and Williams Place underneath the BMT Canarsie Line. The depot also features a paint shop, which is decommissioned and has been used to store buses at times. The north end of the depot (1720 Bushwick Avenue) is used to maintain the museum bus fleet along with Amsterdam Depot, and contains a repair shop for MTA Bus. Also, plans are underway to modify this depot to accommodate articulated-buses in the very near future. The original building on the site was a trolley car barn for the Broadway Railroad's Broadway streetcar line, opened in 1859. The barn began serving buses in 1931, and was acquired by the city during unification in 1940. Construction on the current bus depot began in 1947. The depot was built on top of the subway tunnel roof of the IND Fulton Street Line, which had been built in the early 1940s. The depot opened on December 17, 1950. The trolley barn was replaced by the current depot on October 30, 1956, when Brooklyn streetcar service ended. Also located at the facility is the MTA's bus command center, also known as the East New York Administration Building. The brick structure built along with the current depot is located at the west end of the bus depot, facing Fulton Street at the foot of Alabama Avenue. The center was expanded in 1962, and again in 1969. The MTA plans to construct a new command center across from the depot, to the east of the current complex. The contract for the project was awarded on June 26, 2015. The Flatbush Depot, looking from Flatbush Avenue. The Flatbush Depot is located at 4901 Filmore Avenue in Flatlands, Brooklyn, near the Kings Plaza shopping center, where a number of bus routes terminate. The depot occupies two blocks just off Flatbush Avenue, bounded by Fillmore Avenue, East 49th Street, Avenue N, and Utica Avenue. The Brooklyn Heights Railroad (part of the Brooklyn Rapid Transit Company) opened the depot in mid-1902 along its Flatbush Avenue Line (later the Bergen Beach Shuttle) on Avenue N. It eventually served a number of lines from the Flatbush area, including the Bergen Beach Shuttle, Flatbush Avenue Line, Nostrand Avenue Line, Ocean Avenue Line, and Utica Avenue Line. The barn began serving buses in 1931, and was acquired by the city in 1940. The depot was reconstructed under municipal operations in the late 1940s, designed by architect D. R. Collin of the BRT, and was intended to be the first of a new system-wide design. Few of the former BRT/BMT depots were rebuilt to match such designs. Only Ulmer Park Depot's garage building somewhat matches his new architectural design. The new Flatbush Depot opened for bus service on January 15, 1950, along with Ulmer Park Depot. An adjacent parking lot was added in 1965, and the depot was rehabilitated in 1991. In 2009, the depot became the first to dispatch buses equipped with Plexiglas partitions to protect drivers, after the December 1, 2008 murder of Edwin Thomas, a bus driver who was operating a bus on the B46 Limited route when this incident occurred. The Fresh Pond Depot is located at 66-99 Fresh Pond Road, on the east side of Fresh Pond Road south of Madison Street in Ridgewood, Queens, adjacent to the west of the Fresh Pond Yard of the New York City Subway. It was the site of a trolley depot called the Fresh Pond trolley yard, which was opened in 1907 by the Brooklyn Rapid Transit Company (BRT). In addition to repair shops, the barn hosted a "trolley car school" where new motormen were trained using a mockup of a streetcar's driver cabin. The trolley barn was acquired by the city in 1940, and was closed after the final trolley route from the depot, the Richmond Hill Line (today's Q55 bus), was motorized into trolleybus service on April 26, 1950. The barn was razed in 1957. Construction of the current bus depot was built by the Transit Authority following the motorization of trolley service. Construction began in March 1959. In June 1959, a contract was awarded to rebuild the BMT Myrtle Avenue Line to provide adequate clearance for the passage of buses underneath to the depot. The new depot opened on July 27, 1960 at the cost of $2 million. The new depot was built to be 250 feet (76 m) wide by 500 feet (150 m) long. The initial capacity of the depot was 185 buses. The construction of the depot was required due to the loss of the West 5th Street Depot. In addition, the new depot replaced the Maspeth Trackless Trolley Depot, and Bergen Street depots located in Brooklyn. The new garage featured automatic fueling and washing facilities. The depot is currently assigned around 200 buses, but has been assigned as many as 262 in the past. The depot and subway yard are located in an area once known as Fresh Pond, named for two freshwater ponds located just north of Metropolitan Avenue. This depot houses the buses used on the following local routes, several of which operated from the Fresh Pond barn as streetcar lines: B7 (shared with East New York Depot), B13, B20, B26, B48, B52, B54, B57, B60 (shared with Grand Avenue Depot), Q54, Q55. The Grand Avenue Depot is located between 47th Street and 49th Place on the north side of Grand Avenue in Maspeth, Queens, on the former site of a car rental business, and near the south end of the Newtown Creek. This modern 600,000 square feet (56,000 m2) and environmentally friendly facility is the first of its kind for New York City Transit Authority. The contract for the depot was awarded in 2003 to Granite Construction Northeast, with the design created by Gannett Fleming. The facility partially opened in 2007 housing 19 buses, and fully opened on January 6, 2008. Upon opening, the Grand Avenue Depot took on many routes and buses from the nearby Fresh Pond Depot, relieving overcrowding at that facility. The building design is certified Environmental Management Systems ISO 14001 specifications. The four-story building includes four fueling and defueling stations, cleaning and storage facilities for 200 buses on the first floor, an advanced 27 bus central maintenance facility on the second floor, administrative offices for NYCT's Department of Buses on the third floor, and parking garages for MTA employees on the roof. The central maintenance facility is able to repair and maintain the newer fleet of diesel, diesel hybrid-electric, 60-foot (18 m) articulated, express coach and compressed natural gas (CNG) buses, and has expanded the capabilities of the current East New York central maintenance facility for Brooklyn and Queens. The facility also has four environmentally friendly paint booths − self-contained units that avoid the spread of contaminants. The building meets the needs of expanding demands, and relief of the overcrowding at the Brooklyn Division's other six existing bus garages, and upgrading the Department of Buses' facilities to be state-of-the-art from both environmental and technological standpoints. Also, plans are underway to modify this depot to accommodate articulated-buses, and electrically powered buses in the very near future. Local Routes: B24, B32, B38, B39, B47, B60 (shared with Fresh Pond Depot), B62, Q58, Q59. The Honeymooners-themed museum bus bearing the depot's name. The Jackie Gleason Depot, called the Fifth Avenue Depot until June 30, 1988,:5 is located on the east side of Fifth Avenue between 36th and 39th Streets in Sunset Park, Brooklyn, just west of the 36th-38th Street Yard and Ninth Avenue station of the New York City Subway. The depot had been a passenger terminal named Union Station. Steam trains ran from some of the outlying parts of Downtown Brooklyn where they then continued their journey into Manhattan. Following that, it operated as an elevated car inspection shop from sometime in the early 1900s until approximately 1940, when it was acquired by the city's Board of Transportation. In 1944, it began operation as a bus garage called Fifth Avenue Depot. In 1959, the depot was equipped with heaters to circulate hot water through the heating and cooling systems of buses that had to be stored outside due to the lack of storage space. The depot was later rebuilt, and it opened on September 6, 1984.:5 On June 30, 1988, the depot was renamed after Jackie Gleason, who grew up in Brooklyn and played bus driver Ralph Kramden in The Honeymooners; this renaming occurred one year after Gleason's death. The depot later housed a bus built in 1949 similar to that used on the show, part of the New York Transit Museum fleet. The depot facilitated the first testing of compressed natural gas (CNG) buses in 1992, when a dual-fueled CNG/Diesel bus was housed in the facility. The bus was fueled at the Brooklyn Union Gas Company facility in Greenpoint, Brooklyn. In November 1995, the NYCTA installed a fueling station (leased from Brooklyn Union) at the cost of $1.6 million for several Transportation Manufacturing Corporation (TMC) RTS-06 CNG demonstration model buses. The depot was fully equipped with CNG on June 7, 1999, with the original "slow-fill" fueling station replaced with a "fast-fill" station. It became the first NYCTA depot to support CNG buses. Also, plans are underway to modify this depot to accommodate articulated-buses in the very near future. This depot houses the buses used on the B1School Tripper, B4, B8, B9, B11, B16, B35, B37, B43, B61, B63, B67, B68, B69, and B70 local routes. Looking at the Spring Creek Depot from Flatlands Avenue. The Spring Creek Depot is located on Flatlands Avenue east of Crescent Street in the Spring Creek subsection of Brooklyn's East New York neighborhood, adjacent to the Brooklyn General Mail Facility, and several blocks northeast of the Gateway Center. The depot was built by and owned by the New York City Department of Transportation in 1996, and leased to the Command Bus Company. It was sold to MTA Bus in early 2009. Command's previous depot was several blocks to the northwest on Montauk Avenue and Wortman Avenue (612/626 Wortman Avenue), which now houses the school bus operations of the successor company Varsity Bus Company. In 1988, two Orion I Command buses were fitted by the Brooklyn Union Gas Company with engines that operated on compressed natural gas (CNG). A compressor station was installed at the Wortman Avenue depot. By the mid-1990s, many of the buses operated by Command ran on CNG. Local buses out of this depot continue to operate on compressed natural gas under the MTA. The repaired bus #2185 inside the depot in 2013. The Ulmer Park Depot is located at 2449 Harway Avenue in the neighborhood of Bath Beach, Brooklyn. The depot fills the block bounded by 25th Avenue, Bay 38th Street (which is closed to the public), Harway Avenue, and Bath Avenue. Land for the depot was acquired in 1947, and the facility was constructed in the late 1940s, opening for operation on January 15, 1950. It is a single story 118,800-square-foot (11,040 m2) steel-framed building with a brick exterior. It was rehabilitated in 1983 and 1989. This is the only NYCTA depot in Brooklyn to maintain express buses, storing a total of 285 buses. Ulmer Park is notable for rebuilding, repairing, and housing NYCT Bus 2185, a MCI express coach which was badly damaged during the September 11 attacks in 2001. The name Ulmer Park is a reference to the Ulmer Park resort, operated by William Ulmer of the William Ulmer Brewery in Bath Beach from 1893 to 1899. The Manhattan and Bronx Surface Transit Operating Authority (MaBSTOA), a subsidiary of the New York City Transit Brand, operates all of the local buses in Manhattan. All Manhattan Bus Depots are represented by TWU Local 100. Buses in the Manhattan Division may be swapped between depots on an as-needed basis, and are not reflected in the route assignments as these are short term loans to cover services at these depots. Amsterdam Depot is located on the entire city block bounded by Amsterdam Avenue, Convent Avenue, and 128th and 129th Streets in Manhattanville, Manhattan, several blocks south of the City College of New York. It was built in 1882 as a trolley depot for the Third Avenue Railway. The last trolley was operated from the building on May 17, 1947. The building was then expanded and reopened as a bus garage by Surface Transit Inc., a subsidiary of the Fifth Avenue Coach Company. The MaBSTOA assumed the depot's operations in 1962. The MTA shut down the Amsterdam Depot's bus operations on September 7, 2003, the day the new 100th Street Depot (since renamed the Tuskegee Airmen Depot) opened. The depot was part of the Manhattan Division until spring 1998, when it was transferred to the Bronx Division due to the opening of the Michael J. Quill Depot and the closure of the Walnut Depot. On January 6, 2008, MTA reopened the depot temporarily because of a rehabilitation project at the Mother Clara Hale Depot. Amsterdam Depot closed on June 27, 2010 due to service cuts. The M1 and M7 routes were transferred to Manhattanville, while the M98 route went to Michael J Quill Depot. This garage now houses and maintains most of the museum and vintage bus fleet. The Manhattanville Depot, formerly the 132nd Street Depot, is a three-story structure located in the block bounded by Broadway, Riverside Drive, and 132nd and 133rd Streets in Manhattanville, Manhattan. The depot is viewable from the IRT Broadway – Seventh Avenue Line between 125th Street and 137th Street – City College. The depot holds 192 buses, with storage space on the second and third floors. The original site on 132nd Street and Broadway was a streetcar barn built in 1918 for the Fifth Avenue Coach Company, which later used it for buses. The facility was taken over by the MaBSTOA subsidiary of the Transit Authority in March 1962. It served as the headquarters for the MaBSTOA. The original depot was demolished in the late 1980s, and a new depot was erected opening on November 8, 1992, replacing the old 54th Street Depot (also a former Fifth Avenue Coach facility) which closed the same day. In September 1998, the depot operated a pilot fleet of 10 Orion VI hybrid electric buses. Also that year, it was planned to convert the depot into a compressed natural gas (CNG) facility due to community complaints, but the plan was scrapped due to the high cost of converting such a large facility. The Michael J. Quill Depot fills the block bounded by Eleventh Avenue, the West Side Highway, 40th Street, and 41st Street in Midtown Manhattan, near the Jacob K. Javits Convention Center, Hudson Yards, and the Port Authority Bus Terminal. The depot was originally the New York headquarters and bus garage for Greyhound Lines. Ground broke on the facility on April 26, 1966. It was designed by De Leuw, Cather, and Associates and built by Turner Construction. It was sold to the New York City Transit Authority in 1996. The Transit Authority renovated the facility at the cost of over $35 million. It opened for NYCT operations in spring 1998 as the Westside Depot, replacing the Walnut Depot and 100th Street Depot (the latter since reopened), and was renamed after Michael J. Quill, one of the founders of the Transport Workers Union of America, on July 13, 2000. The Michael J. Quill Bus Depot had received most of its routes from the defunct Hudson Pier Depot, which closed in 2003. The Quill Depot is the largest MTA depot in the city, consisting of three floors and rooftop parking for buses. It is known for a unique "drum-like" structure at the northeast corner of the site, which holds the ramps between the levels. Maintenance facilities are located on the first and second floors. It originally featured training and sleeping quarters for Greyhound drivers. The depot stores around 250 to 350 buses. It is also used for midday layovers for express buses from other boroughs, with additional layover areas nearby in Midtown. The depot was proposed to be relocated to a site on the west side between West 30th and 31st Streets, as part of a planned expansion of the Javits Center, which was slated to be completed by 2010 but never fully commenced. The former Lenox Avenue Car House, now the site of the Hale Depot. The site of the Mother Clara Hale Depot, formerly named the 146th Street Depot until 1993,[self-published source] is located at 721 Lenox Avenue, filling the block bounded by Lenox Avenue, Seventh Avenue, and 146th and 147th Streets in Harlem, Manhattan, two blocks south of the Harlem–148th Street subway station. The three-floor structure has capacity for 150 buses. The depot is named for Harlem humanitarian Clara Hale. The site of the depot was initially home to the Lenox Avenue Car House, a two-story car barn and power station, built by the Metropolitan Street Railway for their Lenox Avenue Line, the first line in the city to use conduit electrification. The line and depot began service on July 9, 1895. The New York City Omnibus Corporation, which had replaced the trolley lines with bus routes in 1936, began constructing a new bus garage on the site in 1938. Operations from the new depot began on July 31, 1939. It was rehabilitated in 1990. This depot had capacity for 123 buses. On September 23, 1993 it was renamed the Mother Clara Hale Depot. The previous depot building closed in January 2008 and was demolished in spring 2009. To make up for the lack of storage space, the Amsterdam Depot reopened temporarily, with some routes shifted to Manhattanville and West Farms. The old depot was originally a part of the Bronx Division. A new garage was built on the site after demolition, designed as a "green depot" with solar panels and features for energy conservation and efficiency. The new depot was opened on November 20, 2014, at the cost of $262 million. The new depot, which can now house 150 buses, has replaced the 126th Street Depot, which lies above a historical 17th century African-American burial ground; it opened as a directly-run NYCT depot in the Manhattan Division like the 126th Street Depot on January 4, 2015, though many routes are operated from other depots. The Tuskegee Airmen Depot, formerly named 100th Street Depot, is located at 1552 Lexington Avenue, filling the block bounded by Park Avenue, Lexington Avenue, and 99th and 100th Streets in the East Harlem neighborhood of Manhattan, north of the 96th Street subway station, and near the 97th St portal of the Park Avenue Tunnel. The depot had been a car barn for streetcars on the Lexington Avenue Line, built in 1895. The depot was closed in spring 1998 and was demolished, and reconstructed, while the Michael J. Quill Depot was opened to replace it. The depot reopened on September 7, 2003, taking on a number of routes from the Hudson Depot. It became the Tuskegee Airmen Depot on March 23, 2012, in honor of the famous World War II airmen. The facility has drawn the ire of many East Harlem residents; many residents cite high asthma rates in the area and the fact that the depot is in a residential area. This depot houses the buses used on the M15, M101, M102, and M103 articulated routes, as well as one standard local route the M31. The depot is also used for midday layovers of express buses from other boroughs. MTA Regional Bus Operations operate various local and express routes under New York City Transit and MTA Bus Company, with three Queens MTA Bus Company depots (Baisley Park, College Point & LaGuardia) being members of Transport Workers Union Local 100 and all Queens NYCT depots, Far Rockaway Depot & JFK Depot being members of ATU Local 1056 and Local 1179 of Queens, New York. All New York City Transit Queens Division supervisors are members of Transport Workers Union Local 106. Note; Buses in the Queens Division may be swapped between depots on an as-needed basis, and are not reflected in the route assignments as these are short term loans to cover services at these depots. The Baisley Park Depot is located at the southeast corner of Guy R. Brewer Boulevard and Linden Boulevard (114-15 Guy R. Brewer Boulevard) in South Jamaica, Queens, in the New York City borough of Queens, northeast of Baisley Pond Park. It is owned by GTJ Reit Inc. (Green, Triboro, Jamaica) Realty Investment Trust, Inc., successor to the former operators and Command Bus Company, and leased to the City of New York, and operated by MTA Bus Company for a period of 21 years. The brick facility was opened in 1966 and was operated by Jamaica Buses; the company's original depot was located across the street (114-02 Guy R. Brewer Boulevard) before the land was acquired by New York State in 1958. On January 30, 2006, it was leased to the City of New York and MTA Bus. Later that year, a bus operator training center was opened at the facility. In 2016, the depot began receiving articulated buses. These buses are mainly used by the Guy R. Brewer Boulevard routes. The Q64 used to be the Q65A of Queens Surface Corporation, later operating from the MTA's College Point Depot until 2010. The QM4, also a former Queens Surface route, operated from the College Point Depot until 2016. Later in the year, the QM44 was created to ease confusion between the Third Avenue and Sixth Avenue branches of the QM4. The remaining routes had been Jamaica Bus routes. The Casey Stengel Depot in 2018, as seen from the footbridge between the Mets-Willets Point subway and LIRR stations. Pay loaders and New Flyer CNG buses at the College Point Depot. The College Point Depot is located on 28th Avenue near Ulmer Street in the College Point section of Queens, near the printing plant of The New York Times and the former site of Flushing Airport. The depot stores around 250 buses. Built in 1997, it is owned by the New York City Department of Transportation and leased to MTA Bus. It had been leased to Queens Surface Corporation before the lease was taken over by MTA Bus. Many buses under Queens Surface used compressed natural gas, and all local bus service from this depot operates using CNG provided by Trillium CNG. In 2006, a unified command center for MTA Bus Company was established at the depot. Also, plans are underway to modify this depot to accommodate articulated-buses in the very near future. Local Routes: Q19, Q23, Q25, Q34, Q38, Q65, Q66. The Q25, Q34, Q65, and Q66 had been Queens Surface routes, while the Q19, Q23 and Q38 (former Triboro Coach routes) had operated from the LaGuardia Depot. The Far Rockaway Depot is situated on Rockaway Beach Boulevard and Beach 49th Street (49-19 Rockaway Beach Boulevard) in Arverne / Edgemere, Queens on the Rockaway Peninsula. The depot was used by Green Bus Lines until January 9, 2006, when MTA Bus took over Green Bus Lines and started operating the old company's bus routes. The depot, as well as JFK Depot, are owned by GTJ Reit, Inc., except for the newly built annex building which is owned by the MTA-NYCTA, and had been used by Green Bus Lines Inc. before being leased to the City of New York and MTA Bus in 2006 for a period of 21 years. The depot has two storage lots and a small maintenance facility. Following damage from Hurricane Sandy, the facility was closed between October 2012 and February 2013, with its fleet housed at Building 78 on the grounds of John F. Kennedy International Airport two blocks away from the JFK Depot. In 2014, the MTA opened a new annex building with a modern and updated maintenance facility, to expand this facility in order to maintain and support more buses. The project to fully restore the depot was scheduled to begin in 2015, but has yet to begin as of 2016. It has also been proposed to partially power the facility using wind turbines. The Jamaica Depot is located on the west side of Merrick Boulevard just south of Liberty Avenue in Jamaica, Queens. The depot lies between Merrick Boulevard to the east and 165th Street to the west, and spans about three blocks north-to-south between South Road and 107th Avenue, located across the campus of York College. The depot was opened by the North Shore Bus Company in August 1940 and inherited by the Board of Transportation in 1947. An addition was constructed in 1950, adding additional storage and a bus washing area. The depot was expanded again in 1968, and from 1993 to 1994. The 58,000 square foot depot is the oldest existing New York City Transit Depot. [a] It holds 150 buses at capacity, but is assigned 208 buses, many of which are parked on the surrounding streets. Due to its age and capacity issues and to accommodate articulated buses, the MTA plans to demolish the existing structure and build a new and expanded depot on the same site, as well as on 50,000 square feet of adjacent property purchased in April 2014. Construction was anticipated to begin in 2018, and be complete by 2022, with all of its buses, and local routes temporarily sent to other depots. This depot houses the buses used on the Q3, Q4, Q5, Q17, Q30, Q42, Q77, Q84, and Q85 local routes. An out-of-service bus in front of the JFK Depot. John F. Kennedy Bus Depot or JFK Depot, along with Far Rockaway Depot, is an MTA Bus garage that used to be operated by Green Bus Lines and was assumed by MTA Bus on January 9, 2006. It was the primary storage and maintenance facility for the company. The depot was built from 1951 to 1952 at the cost of $500,000. It is owned by GTJ Reit Inc (the successor to Green Lines) and is leased to the City of New York and operated by MTA Bus for a period of 21 years. JFK Depot is located in Springfield Gardens at 147th Avenue and Rockaway Boulevard (165-25 147th Avenue) near JFK Airport. Buses at the LaGuardia Depot, including a former Triboro Coach RTS bus (far right). LaGuardia Depot is located on a two-block long structure (85-01 24th Avenue) bound by 85th and 87th Street, and 23rd and 24th Avenues in the East Elmhurst & Jackson Heights neighborhoods of Queens, New York near LaGuardia Airport. The depot was opened on January 15, 1954, is owned by GTJ Reit Inc, and was operated by Triboro Coach Corporation before being leased to the City of New York and operated by MTA Bus Company on February 20, 2006 for a period of 21 years. In 1989, a methanol fuel station was installed at the facility for six General Motors-built RTS methanol buses. It was later used in the early 1990s to fuel an NYCT demonstration bus from the Casey Stengel Depot and three new Triboro-operated RTS buses fitted with special Detroit Diesel Series 92 engines. Beginning in 1994, the facility dispatched compressed natural gas (CNG) buses in addition to its diesel fleet. The depot was decommissioned from CNG operations in 2006 due to not meeting the MTA's safety and environmental standards. On April 10, 2006, while workers from KeySpan were removing CNG from tanks and a private contractor was conducting construction near the depot, a gas compressor station exploded leading to a large fire at the depot. One bus was destroyed and 12 were damaged. Also, work to modify this depot to accommodate articulated-buses is almost completed. This depot houses the following bus routes. Many of these used to be Triboro Routes. Several had been Queens Surface Corporation routes that operate in western Queens, which were closer to the LaGuardia Depot than their former Queens Surface depot in College Point. The Queens Village Depot, looking from a passing LIRR train. The Queens Village Depot is located on 97-11 222nd Street between 97th and 99th Avenues in Queens Village, Queens, across to the west from Belmont Park. The MTA began acquiring land for the depot in 1968. The depot was opened on September 8, 1974, and it is on the site of what was Dugan's Bakery. Upon opening, the depot received many former North Shore Bus Company routes from the existing Casey Stengel and Jamaica Depots, and relieved overcrowding at those depots. In 1979, the buses from the depot tested a radio-based real-time information system called the "Radio-Data-Locator System", precursor to MTA Bus Time. The depot was renovated in 1987. The depot stores around 250 buses. It has 202,178 square feet (18,783.0 m2) of space. The Queens Village Depot building won an Award Honor for engineering excellence from the New York Association of Consulting Engineers. All Staten Island division bus depots are the members of Amalgamated Transit Union Local 726 of Staten Island, New York and are all operated by New York City Transit. Note; Buses in the Staten Island Division may be swapped between depots on an as-needed basis, and are not reflected in the route assignments as these are short term loans to cover services at these depots. Castleton Depot, also called Castleton Avenue Depot, is located on 1390 Castleton Avenue and fills the block bounded by Jewett Avenue, Hurst Street, Castleton Avenue, and Rector Street in Port Richmond. A large parking lot on the east side of Rector Street is also used for bus storage. The depot was constructed in the late 1940s to provide urgently needed storage space for city-owned buses on Staten Island. When Isle Transportation went bankrupt in 1947, the city's Board of Transportation (predecessor of NYC Transit) took control of the majority of Staten Island bus operations. It was built to hold 135 buses, and can now store about 340 buses. Express Routes: SIM1 (shared with Charleston, and Yukon Depots), SIM3 (shared with Meredith Av Depot), SIM22, SIM34 (shared with Meredith Av Depot), SIM35 (shared with Meredith Av Depot). The Charleston Depot is located at 4700 Arthur Kill Road near the Outerbridge Crossing in Charleston, Staten Island. The facility includes a 87,000-square-foot (8,100 m2) two-story building, with enough room to service and maintain 220 buses, but also includes outdoor parking for buses and employees. The site was selected in 2000. The depot was announced in September 2005 as part of the MTA's 2000-2004 Capital Plan, to relieve the overcrowding and maintenance and storage pressure's between the Castleton and Yukon bus depots, both of which had limited bus storage space. The depot was also intended to help expand express bus service in Staten Island, and improve service for then-36,000 Staten Islanders who used express buses. A new depot had been planned for around 30 years, and attempts to secure funding lasted around a decade. After delays due to lack of funding, construction on the depot (then called the Charleston Bus Annex) began on February 15, 2008. The depot was opened on December 6, 2010. The Meredith Avenue Depot or Meredith Depot is located at 280 and 336 Meredith Avenue, at the intersection of Meredith Avenue and South Avenue (formerly Chelsea Road) near the shoreline of Arthur Kill and Prall's Island in Chelsea. This depot was constructed in 2009 to expand storage capacity in the borough, with the MTA operating the site on a 15-year lease. The depot was built on largely vacant land, with the exception of an 1890s-era house. It has space for 80 buses, and light maintenance facilities. It operates only from Monday to Friday, and houses exclusively express buses, which are rotated from the other Staten Island depots. Meredith Avenue depot was closed due to damage from Hurricane Sandy, but has since reopened. Express Routes: SIM3 (shared with Castleton Av Depot), SIM4X (shared with Charleston Depot), SIM15, SIM30, SIM32, SIM33, SIM34 (shared with Castleton Av Depot), SIM35 (shared with Castleton Av Depot). Express Routes: SIM1 (shared with Castleton Av, and Charleston Depots), SIM5 (shared with Charleston Depot), SIM6 (shared with Charleston Depot), SIM7 (shared with Charleston Depot), SIM10 (shared with Charleston Depot). Below are the depots formerly used by the MTA and its predecessors for municipal bus operations, excluding facilities inherited by the city but not used for city-operated buses. Many of the depots were demolished or abandoned following their closure. Some have been converted for other uses by the MTA or other organizations. One depot, the 54th Street Depot, was demolished to make room for a new MTA facility outside of bus operations. The West 5th Street Depot was located at the northwest corner of West 5th Street and Surf Avenue in Coney Island, Brooklyn, adjacent to the Brighton Beach neighborhood, and across from the current New York Aquarium, as well as near the former Luna Park amusement park. It was originally the site of a railroad and trolley terminal called the Culver Depot, built by the Prospect Park and Coney Island Railroad, operators of the Culver surface line along present-day McDonald Avenue in 1875. This depot was built on Surf Avenue between West 5th Street and West 8th Street, serving surface railroad and later Brighton and Culver elevated trains, as well as streetcars. The terminal also served the streetcar lines of the competing Coney Island and Brooklyn Railroad, including its Smith Street Line. A second adjacent facility on West 5th Street, also known as the Smith Street Trolley Depot, was built by the Coney Island and Brooklyn Railroad in 1912 exclusively for streetcars. Both streetcar companies as well as the Culver and Brighton lines would become part of the BRT by middle of the decade. By 1920, all elevated trains were moved west to the BRT's West End Depot, and the original Culver terminal was razed in 1923, with all streetcar service going to the West 5th Street Depot. As a streetcar facility, it featured a concrete storage garage at its north end, and a two-floor passenger terminal building at its south end facing Surf Avenue, with seven track loops in the center of the complex for terminating streetcars. The passenger concourse featured a restaurant, and a carousel which would later be moved to Manhattan to become the Central Park Carousel. The depot would be absorbed into municipal operations during unification in 1940. On October 30, 1956, the last streetcars operated to the depot along McDonald Avenue, at which point it was likely converted for bus service. The bus depot was closed on July 27, 1960, replaced by the Fresh Pond Depot in Queens. The depot was closed due to traffic congestion in Coney Island. By 1962, the site of the depot and former terminal was cleared. It is now the site of the Brightwater Towers apartment complex, built in the 1960s shortly after the depot was demolished. The 12th Street Depot was located at East 12th Street between 1st Avenue & Avenue A in Lower Manhattan. It used to be a taxi garage. It was acquired from the Fifth Avenue Coach Company in 1962. As a bus depot, the facility could only house 50-60 buses, which were assigned to Lower Manhattan routes such as the M12 (discontinued in 1979), M13, and M14A/M14D. The remaining buses on the routes came from depots in Midtown and Upper Manhattan, or were stored on the street. The depot was closed and replaced by the Hudson Pier Depot in 1971. The 37th Street Depot or 39th Street Depot was located west of Second Avenue between 37th and 39th Streets along the Gowanus Bay portion of the Upper New York Bay in the South Brooklyn Marine Terminal in Greenwood, Brooklyn. Located across from many former Bush Terminal buildings, it was adjacent to the coastal yard of the South Brooklyn Railway, and west of the current Jackie Gleason Depot and 36th–38th Street Yard. The site consisted of two buildings purchased from the Department of Marine and Aviation in 1948, storing 200 buses. The depot was near the former 39th Street Ferry Terminal, served by Church Avenue Line streetcars until 1956. The 54th Street Depot was located on Ninth Avenue, between 53rd Street, and 54th Street streets in Midtown Manhattan. The address was 806 Ninth Avenue. It was built as the car barn of the Ninth Avenue Railroad in the late 1800s. The streetcar line was replaced by Fifth Avenue Coach Company buses on November 12, 1935, and the facility became a bus depot for the company. In March 1962, it fell under municipal operations. This depot was closed in 1992 and replaced by the newly rebuilt Manhattanville Depot, and was demolished between 1996 and 1997, and replaced by the Rapid Transit Division's Rail Command Control Center, at 354 West 54th Street between Eighth and Ninth Avenues. Before it closed in 1992, it operated the following Manhattan bus routes, M6, M7, M11, M42, M27/M50, M57, M72, and M79. The contract for the command center was awarded in November 1997, with the intent of creating a central control room for the New York City Subway that would implement automation of the system, including automatic train protection. [self-published source] The use of non-union labor by the construction contractor led to a protest by thousands of union members at the site and at the MTA's midtown headquarters in June 1998. Adjacent to the control center is an NYCT parking lot on the east side of Ninth Avenue. The parking lot is planned to be redeveloped into affordable housing as part of the "Western Rail Yard" project, which would redevelop this site and the West Side Yard on West 33rd Street. The 126th Street Depot fills the city block bounded by First Avenue, Second Avenue, and 126th and 127th Streets, near the Harlem River Drive, Triborough Bridge, and Willis Avenue Bridge in East Harlem, Manhattan. The address is 2460 Second Avenue, and the depot's decal has "126" in Roman numerals (CXXVI). A former trolley yard, the site was opened as a bus depot in 1947 by Surface transit Inc., the successor to the streetcars of the Third Avenue Railway. It would later be used by the New York City Omnibus Corporation until 1962, when it would be taken over by the Transit Authority (as opposed to its MaBSTOA subsidiary) when its parent company Fifth Avenue Coach folded. It housed the buses (and served as a northern terminal) for the M15 SBS and M15, the second busiest bus route in the United States and the busiest in the city carrying over 60,000 passengers a day. Before it closed for the first time in 2015, it operated four additional local lines: M31, M35, M60 SBS, and M116. Several structures have occupied the site since the beginning of European settlement of the area. In the late 19th Century, an amusement park and dance hall were erected on the site. It then was used by the Cosmopolitan Productions studio owned by William Randolph Hearst until 1923. In 2008, a historical 17th century African American burial ground used by the Low Dutch Reformed Church of Harlem, the first church in Harlem, and its successor the Elmendorf Reformed Church, was discovered at the site. The MTA consequently agreed to move most of the depot's routes to the reopened Mother Clara Hale Depot. The 126th Street Depot closed on January 5, 2015, with the land returned to the city; it was slated to be demolished. Two outdoor annexes are located near the depot, one across of Second Avenue, and one two blocks north on East 128th Street, adjacent to Harlem River Park. The lot on 126th Street is used for bus storage and employee parking. The 128th Street facility is used to store express buses during midday hours. These facilities were added in 1989 and 1991, and in the mid 2000s. The 128th Street annex is on the former site of the storage yard for the 129th Street Station of the Second and Third Avenue elevated lines. The former Bergen Street Depot, now an MTA Sign Shop. The Bergen Street Shop is located at 1415 Bergen Street/1504 Dean Street between Albany and Troy Avenues in Crown Heights, Brooklyn. The facility is bound by Dean Street at its north end and Bergen Street at its south end. It currently serves as the New York City Transit Sign Shop (also called the Bergen Sign Shop or Bergen Street Sign Shop), producing numerous signs for the Transit Authority, particularly those used in the New York City Subway. It was originally the Bergen Street Trolley Coach Depot, operated as a streetcar barn by the Brooklyn, Queens County and Suburban Railroad, and later under the BRT/BMT system until unification in 1940. It was reconstructed and enlarged under city operations between 1947 and 1948, and reopened on September 16, 1948 as a trolleybus (trolley coach) depot. The depot served the Bergen Street Line (B65), Lorimer Street Line (B48), St. Johns Place Line (B45), Graham Avenue Line and Tompkins Avenue Line (B43), and Flushing Avenue Line (B57). The depot stored 122 trolley coaches, and may have also stored diesel buses. The building was converted into the current sign shop when trolleybus service ended on July 27, 1960, replaced by the Fresh Pond Depot in Queens. Brook Street Depot is located at 100 Brook Street/539 Jersey Street in Tompkinsville, Staten Island. The site is bound by Brook Street to the north, Victory Boulevard to the south, Pike Street to the east, and Jersey Street and Castleton Avenue to the west. It was originally a streetcar barn built around 1902 for the Richmond Light and Railroad Company, which became Richmond Railways in 1927. The barn became a bus depot for the successor Staten Island Coach Company between 1934 and 1937. The depot was taken over by Isle Transportation in 1946. It was acquired by the city Board of Transportation in 1947, and was rebuilt in the late 1940s for municipal bus operations. The new depot was designed to store 100 buses. In 1958 the depot, now under the control of the New York City Transit Authority, was turned over to the New York City Board of Estimate. That year, it was converted into a garage for the New York City Department of Sanitation (DSNY). In response to local community opposition of the site, the city plans to replace the depot with a new DSNY garage on the West Shore near the former Fresh Kills Landfill, while the old depot is planned to be replaced with a residential development. Access-A-Ride vehicles stored at the Crosstown Depot. The Crosstown Depot, also referred to as the Crosstown Annex Facility or Crosstown Paint Shop, is located at 55/65 Commercial Street near the intersection of Commercial and Box Streets in the neighborhood of Greenpoint, Brooklyn, on the southern shore of Newtown Creek. The first Crosstown Depot was opened in 1885 as a streetcar depot by the Brooklyn Heights Railroad, located at Manhattan Avenue between Box and Clay Streets. It later become part of the BRT/BMT system under the Brooklyn and Queens Transit Corporation (B&QT). The original depot consisted of a two-story brick building, with trolley loops at ground level used for turning trolleys. Around 1945, the depot was no longer used for streetcar operations. In September 1951, the old Crosstown Depot was sold by the Board of Transportation and used as a warehouse for a box manufacturer. On June 30, 1952, the depot was the origin point of an eight-alarm fire that killed at least one person and destroyed 15 buildings including the depot. The site on Commercial Street was originally a refinery for the American Sugar Refining Company (predecessor to Domino Sugar) opened in 1868, and later became a trolley storage yard and washing facility for the B&QT. In 1946 the Board of Transportation began constructing a new facility on this site, opened in July 1949 as the Crosstown Trolley Coach and Car Depot to serve 78 trolley coaches and 60 trolley cars. It was fully converted into a bus depot in 1954. The current depot consists of a two-story brick administration building facing Commercial Street, and shop for repairs, inspection and washing facing Newtown Creek, along with a large storage lot for buses. The depot holds around 120 buses at capacity. At one time, it operated ten lines: B18 (discontinued), B24, B29 (now part of the B24), B30 (discontinued), B39 (discontinued/reestablished 2013), B48, B59 (now Q59), B60, B61 (originally the Crosstown Line, since split into a new B61 and B62), and B62 (now part of the B43). The B62's northern terminal was located one block away from the depot at Manhattan Avenue and Box Street. The depot operations ended on November 7, 1981 because of service reductions and operating cost. It later stored several new General Motors-built RTS-04 buses awaiting entry into revenue service in 1982. The Crosstown Depot has since been converted to a paint shop and road service operations facility, located in the former repair shop. The facility contains three paint booths to paint MTA buses, the third of which was installed in 2001. The paint shop operations were consolidated into those of the Grand Avenue Facility when the latter opened in 2008. The site also houses the New York City Subway's Department of Emergency Response in the former administration building, and an Access-A-Ride storage facility utilizing the former bus storage area. The site is planned for redevelopment into a waterfront park, called "Box Street Park". The DeKalb Depot, also known as the DeKalb Avenue Depot or DeKalb Avenue Shops, was located on the east side of DeKalb Avenue between Onderdonk and Seneca Avenues in Ridgewood, Queens. It was built as a trolley barn by the Brooklyn City Railroad in the early 20th Century, later becoming part of the BRT/BMT system. It served several streetcar lines, including the DeKalb Avenue Line (today's B38), while its shops performed heavy maintenance. The facility was absorbed into municipal operations in 1940, and was converted into a trolley coach repair shop in April 1949. The site is now occupied by a supermarket, sitting across from the athletic field of Grover Cleveland High School. The Edgewater Depot, also called Edgewater Pier, was located at 60/171 Edgewater Street on the coastline of Rosebank, Staten Island, the former area of the Pouch Terminal (Piers 20 and 21). It was leased from Pouch Terminal, Inc. in 1977, and used to relieve overcrowding at the Staten Island Depot (now Castleton Avenue Depot), which had been the only bus depot in the borough. It was later discovered that the terminal was about to be foreclosed, and could have been acquired by the city at no cost. A fire destroyed Pier 20 in 1978, rendering the depot useless until 1983. During that time, the depot stored several new General Motors-built RTS-04 buses awaiting entry into revenue service in 1982. On February 18, 1983, two GMC fishbowl buses on loan from Washington DC's Washington Metropolitan Area Transit Authority (WMATA) fell into the Narrows after one of its piers collapsed. Although the TA initially planned to rehabilitate the depot, Edgewater was permanently abandoned in 1985 when it was found to be structurally unsafe for use as a bus depot. An office building is located near the site, at 1 Edgewater Street or 1 Edgewater Plaza, used by the MTA, Staten Island Community Board 1, and other organizations. It was originally a Pouch Terminal warehouse, re-purposed for office use from 1973 to the 1980s. 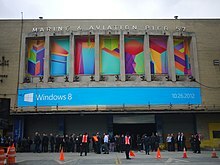 The front facade of Pier 57 in 2012. The Hudson Depot or Hudson Pier Depot was located on Hudson River Pier 57 at 15th Street in the present Hudson River Park in Chelsea, Manhattan. The address was 11 11th Avenue. This depot was built from 1950 to 1954 as a shipping pier. The pier was abandoned in 1967 by Grace Line and remained unused for several years. In December 1971, the New York City Transit Authority took possession of the vacant building, and upgraded it to facilitate bus fueling and storage. This was opposed by the International Longshoremen's Association, who desired the facility to be reactivated for maritime operations, and by local civic organizations. The depot opened on September 11, 1972, replacing the 12th Street Depot, and providing indoor storage for over 200 buses previously parked on city streets. It held up to 165 buses. The Hudson Depot was intended to be temporary, but was kept in service when plans to construct new depots failed, and due to the closure of the 54th Street Depot. The depot was closed on September 7, 2003, the same day the 100th Street Depot reopened, and its routes such as the M8, M10, M11, M13, M14A/M14D, M20, M21, M22, M23, M16/M34, and half of the Q32 were transferred to both the 100th Street Depot and the reopened Michael J. Quill Depot (except the M10, and M11, transferred to Manhattanville, and later some M11 and M116 runs were shared with Michael J.Quill Depot in an effort to ease the severe overcrowding at Manhattanville Depot, where many of their buses are stored on the local streets during nighttime hours). The Walnut Depot or Walnut Avenue Depot was located on the south side of 132nd Street at Walnut Avenue east of the Hell Gate Bridge in Port Morris, Bronx, on the coastline of the East River and the mouth of the Bronx Kill. The address was 900 East 132th Street. NYCTA bought the former warehouse from the F. W. Woolworth Company for $1.8 million in 1979, and rebuilt it into an operating bus depot, and opened it to buses on April 3, 1983, replacing the old and dilapidated West Farms Depot which was closed on the same date, and also to relieve overcrowding at the existing Coliseum and Kingsbridge Depots. On February 21, 1993, the Walnut depot closed for rehabilation and was replaced by the current Kingsbridge Depot which reopened that same day after undergoing reconstruction. Walnut reopened in 1995 and replaced the Coliseum Depot, which by then closed for rehabilitation as well. The depot was planned to be closed around 2000, but was abruptly sold in early 1998 to the Empire State Development Corporation and later the Galesi Group for the construction of a new printing plant for the New York Post. Walnut Depot permanently closed in spring 1998, replaced by the Michael J. Quill Depot. At the time of its closure, it housed 220 buses, and operated the following Bronx routes, Bx4/4A, Bx6, Bx11, Bx13, Bx15, Bx17, Bx19, Bx33, Bx35, Bx41, and Bx55 Limited which was later discontinued, and replaced with a Bx15 Limited in 2013 instead. The depot was demolished in order to construct the Post printing plant. The West Farms Depot was located at 1857 Boston Road, just north of the 174th Street subway station in the Crotona Park East section of the Bronx. The site consisted of two maintenance buildings, one on a triangular plot bound by East 175th Street, Southern Boulevard, and Boston Road, and the second on the north side of 175th Street and the Cross Bronx Expressway on the east. Built in 1894 by the Union Railway as a car barn, it was used to store and maintain buses until April 3, 1983, when it was closed and replaced by the Walnut Depot, and later the Gun Hill Depot. Before it closed in early 1983, it serviced the following Bronx Local Routes; Bx3 Prospect/Crotona Av's (now Bx17), Bx11 170 Street/Claremont Pkwy. Crosstown, Bx25 Morris/Jerome Av's (now Bx32), Bx26 Boston Road/Morris Park Av (now Bx21), Bx28 Williamsbridge (now Bx39), Bx29 125 Street X-Town & Willis/Third Av's (now Bx15 & Bx15 LTD), Bx31 145/149 Street X-Town & Southern Blvd (now Bx19), Bx32 Saint Ann's Avenue (discontinued in 1984), Bx34 155/163 Street Crosstown & Hunts Point Av (now Bx6), Bx35 167/169 Street's Crosstown, Bx41 Webster Av-White Plains Road, Bx42 Westchester Avenue (now Bx4/Bx4A), and Bx49 Highbridge (discontinued and combined with Bx13). The buildings continued to stand as recently as 2002, decaying and becoming havens for crime. The depot has since been demolished, replaced by housing developments and a self storage facility. The nearby Coliseum Depot was renamed the West Farms Depot when it reopened in 2003. ^ The Jamaica Depot is the oldest continuously-operating depot under New York City Bus. Several depots are older, but have been rebuilt, with the original structure demolished. ^ a b c d e f "MTA Twenty-Year Capital Needs Assessment 2015-2034" (PDF). Metropolitan Transportation Authority. October 2013. Retrieved August 11, 2015. ^ "MTA Capital Program 2015-2019: Renew. Enhance. Expand" (PDF). Metropolitan Transportation Authority. October 28, 2015. Retrieved October 28, 2015. ^ a b c d e f g h i j "MTA Capital Program 2015-2019" (PDF). mta.info. Metropolitan Transportation Authority. September 24, 2014. Retrieved July 17, 2015. ^ a b c d e f g h i j k l Silverman, Norman (July 26, 2010). "The Merger of 7 Private Bus Companies into MTA Bus" (PDF). apta.com. American Public Transportation Association, Metropolitan Transportation Authority. Archived from the original (PDF) on October 16, 2015. Retrieved October 16, 2015. ^ a b c d e f g h i j k l m n o p q r s t u v w x y z aa ab ac ad ae af ag ah ai Report for the three and one-half years ending June 30, 1949. New York City Board of Transportation. 1949. ^ Report including analysis of operations of the New York City transit system for five years, ended June 30, 1945. New York City: Board of Transportation of the City of New York. 1945. ^ a b c d e f Sparberg, Andrew J. (October 1, 2014). From a Nickel to a Token: The Journey from Board of Transportation to MTA. Fordham University Press. ISBN 978-0-8232-6190-1. ^ a b c d e f g h Brian J. Cudahy (January 2002). How We Got to Coney Island: The Development of Mass Transportation in Brooklyn and Kings County. Fordham University Press. ISBN 978-0-8232-2208-7. ^ a b c d e f g h i j "New York City Transit Facts & Figures: 1979" (PDF). La Guardia and Wagner Archives. Metropolitan Transportation Authority, New York City Transit Authority. 1979. Retrieved October 24, 2016. ^ a b c Kenneth T. Jackson; Lisa Keller; Nancy Flood (December 1, 2010). The Encyclopedia of New York City: Second Edition. Yale University Press. ISBN 978-0-300-18257-6. ^ a b c d Conklin, William R. (March 28, 1947). "City to Take Over Bus Line That Failed on 5-Cent Fare: Will Begin Operation on 27 Routes of the North Shore Company Tomorrow to Assure Uninterrupted Service" (PDF). The New York Times. Retrieved September 6, 2016. ^ Crowell, Paul (September 24, 1948). "2 BUS COMPANIES OPERATING 6 LINES ARE BOUGHT BY CITY; Transportation Board Begins Operation at 12:01 A.M. Today on 7-Cent Fare" (PDF). The New York Times. p. 1. Retrieved March 27, 2016. ^ a b c d "2 New Bus Garages To Open In Brooklyn" (PDF). The New York Times. January 15, 1950. Retrieved September 1, 2016. ^ a b c d "Transit Depot to Open: Trolley Coaches Will Operate on Line in Brooklyn" (PDF). The New York Times. September 15, 1948. Retrieved September 1, 2016. ^ a b c d "Bergen St. Trolley-Coach Depot Starts Operations Tomorrow". Brooklyn Daily Eagle. Fultonhistory.com. September 15, 1948. p. 17. Retrieved September 1, 2016. ^ a b c d e Sibley, John (March 22, 1962). "City Seizes Buses; Full Service Due 6 A.M. Saturday" (PDF). The New York Times. Retrieved September 6, 2016. ^ a b c d e McKinley, Jr., James C. (January 9, 1995). "A Fleet in Decay: A special report. ; New York's Bus Service Worsens With Little Help on the Horizon". The New York Times. Retrieved September 6, 2016. ^ a b c d "MTA Board Action Items: July 2015" (PDF). Metropolitan Transportation Authority. July 2015. Archived from the original (PDF) on March 4, 2016. Retrieved December 17, 2015. ^ Stengren, Bernard (April 4, 1964). "5th Ave. Bus Lines Operate In Black; $4,054,256 Reported in 15 Months for Seized Routes" (PDF). The New York Times. Retrieved September 24, 2016. ^ Levey, Stanley (March 27, 1962). "New Bus Seizures Asked; Line Planning Runs Today" (PDF). The New York Times. Retrieved September 24, 2016. ^ "Bus Strike Is Set For Early Today; Mayor's Plea Vain" (PDF). The New York Times. March 10, 1941. Retrieved September 24, 2016. ^ a b c d e Lueck, Thomas J. (April 23, 2005). "City to Buy Private Bus Company for Service in Three Boroughs". The New York Times. Retrieved October 13, 2015. ^ a b Rutenberg, Jim; Ramirez, Anthony (March 23, 2005). "Metro Briefing New York: Bronx: City To Take Over Another Bus Line". The New York Times. Retrieved October 31, 2015. ^ a b c d e f g h i j "Green Bus Lines, Inc., Triboro Coach Corporation, Jamaica Central Railways, Inc". sec.gov. GTJ Reit, Inc. February 9, 2007. Retrieved January 2, 2016. ^ a b c d e "Proposed MTA Capital Program 2010–2014" (PDF). nysenate.gov. Metropolitan Transportation Authority. September 23, 2009. Retrieved September 8, 2016. ^ a b c d e f g h i j k l m n "Notice of Addendum: Addendum #4" (PDF). Metropolitan Transportation Authority. May 2012. Retrieved October 12, 2016. ^ a b c d e f g "About NYCT Transit: Buses". Metropolitan Transportation Authority. Archived from the original on November 4, 2013. Retrieved May 24, 2007. ^ a b c d e "Capital Program 2000–2004". MTA New York City Transit Authority. Archived from the original on February 9, 2005. Retrieved December 30, 2016. ^ a b c d e f "Supplementary Information for §1269(d): 2012-2017" (PDF). Metropolitan Transportation Authority. 2012. Retrieved October 12, 2016. ^ a b c d e "ENB - REGION 2 NOTICES". New York State Department of Environmental Conservation. December 20, 2000. Retrieved November 4, 2016. ^ a b c d e f "ENB Region 2 Completed Applications 12/06/2000". New York State Department of Environmental Conservation. December 16, 2000. Retrieved November 5, 2016. ^ a b c d e f "Broadway Junction Transportation Study: NYC Department of City Planning Final Report-November 2008" (PDF). nyc.gov. New York City Department of City Planning. November 2008. Archived from the original (PDF) on June 6, 2010. Retrieved October 27, 2015. ^ a b c "Development of Repair Time Standards for Engine & Transmission (power plant) Replacement of Transit Vehicles: Final Report" (PDF). usf.edu. Florida Department of Transportation. July 27, 2006. Retrieved October 22, 2016. ^ a b c d e f g h i j k l m n o STV Incorporated (May 2016). "DRAFT SCOPING DOCUMENT For the Proposed Reconstruction and Expansion of Jamaica Bus Depot: Draft Environmental Impact Statement" (PDF). Metropolitan Transportation Authority. Retrieved May 20, 2016. ^ "Buses". Metropolitan Transportation Authority. ^ "MTA NYC Transit 1996 - 2005 A Decade of Accomplishments". Metropolitan Transportation Authority. January 3, 2007. Retrieved December 31, 2016. ^ Kennedy, Randy (June 16, 2002). "New York's Bus Cleanup Brings Other Cities On Board". The New York Times. Retrieved November 5, 2016. ^ Rayman, Graham (November 6, 2007). "Bus Kill". The Village Voice. Retrieved November 5, 2016. ^ a b c d e f g h i j k l m n o p q r Urbitran Associates, Inc (May 2004). "NYCDOT Bus Ridership Survey and Route Analysis Final Report: Chapter 3 Transit System Characteristics" (PDF). nyc.gov. New York City Department of Transportation. Retrieved October 16, 2015. ^ a b c Donohue, Pete (October 31, 2008). "The living-dead buses in the Bronx". Daily News (New York). Archived from the original on October 29, 2014. Retrieved October 16, 2015. ^ a b Klein, Jeffrey D. (July 25, 2007). "Klein & Mta Bring Better Bus Service To Bronx". New York State Senate. Retrieved September 21, 2016. ^ a b "Ribbon Cutting at Eastchester Depot". TWU Local 100. August 13, 2015. Retrieved October 16, 2015. ^ a b "Ribbon Cutting at Eastchester Depot". YouTube. TWU Local 100. August 13, 2015. Retrieved October 16, 2015. ^ Buiso, Gary (December 2, 2012). "More burning questions about NYC answered". The New York Post. Retrieved October 16, 2015. ^ a b c "Greening Mass Transit & Metro Regions: The Final Report of the Blue Ribbon Commission on Sustainability and the MTA" (PDF). Metropolitan Transportation Authority. February 2009. Retrieved October 29, 2015. ^ a b Seaton, Charles A. (January 1, 2009). "MTA New York City buses serve as organ donors:". BUSRide Magazine. Archived from the original on October 26, 2016. Retrieved October 25, 2016. ^ Martinez, Jose (March 9, 2016). "When A City Bus Reaches the End of the Line, For the Last Time, Every Part that Can Be Salvaged is Stripped". NY1. Retrieved October 25, 2016. ^ a b "MTA Subsidiary Public Benefit Corporations Report 2014, Pursuant to Public Authorities Law Section 2827-a" (PDF). Metropolitan Transportation Authority. 2014. Retrieved October 29, 2015. ^ a b "MTA Bus: Eastchester Depot Pick Glossary; Effective: 09/04/2016". MTA Bus Company. 2016. Retrieved August 7, 2016. ^ a b "Commuters fear depot changes will delay QM2, QM20 buses". Times Ledger. December 20, 2013. Retrieved October 16, 2015. ^ a b c d "Bus Support Facilities: Conditions and Needs" (PDF). United States Department of Transportation, Federal Transit Administration. January 1993. Retrieved November 7, 2016. ^ a b "FEARS VOICED ON USING DUMP CITE FOR DEPOT". The New York Times. April 4, 1982. Retrieved November 7, 2016. ^ a b c Poust, Mary Ann (May 18, 1981). "Proposed bus garage creates a controversy". Gannett Westchester Newspaper. Fultonhistory.com. p. 14. Retrieved January 16, 2017. ^ "Tuckahoe Board Denies Town Use Of Quarry For Dumping". Mount Vernon Daily Argus. Tuckahoe (village), New York. Fultonhistory.com. June 12, 1951. Retrieved January 17, 2017. ^ Goldman, Ari L. (September 30, 1979). "New Law Impounding Trucks and Fining Drivers Goes Into Effect Tomorrow". The New York Times. p. 6. Retrieved January 17, 2017. ^ a b c d e f Kennedy, Randy (February 13, 1994). "NEIGHBORHOOD REPORT: WEST FARMS; Two Decrepit Buildings, in Limbo, Become a Crime Haven". The New York Times. Retrieved September 20, 2016. ^ Poust, Mary Ann (1983). "Community group loses bus depot fight". Herald Statesman. Fultonhistory.com. Retrieved January 16, 2017. ^ a b c d e Gray, Christopher (December 31, 1989). "treetscapes: The Kingsbridge Car Barn; Vacant, Outmoded and Nearing the End of the Line". The New York Times. Retrieved November 7, 2016. ^ Flynn, Kevin (October 19, 1995). "STRAPHANGERS HUNG OUT TO DRY MTA BUST STOP PAYS BIG BUX-OM". New York Daily News. Retrieved November 7, 2016. ^ Beekman, Daniel (October 13, 2011). "MTA tees up plans to sell driving range in Bronx for retail development". New York Daily News. Retrieved November 7, 2016. ^ Goodstein, Steven (April 29, 2016). "Shopping center to be built at former golf range". Bronx Times-Reporter. Retrieved November 7, 2016. ^ Anuta, Joe (November 15, 2013). "Bidders snap up site for new mall in the Bronx". Crain Communications. Retrieved November 7, 2016. ^ Revkin, Andrew C. (July 25, 1996). "Under Solar Bill, Homeowners Could Cut Electric Cost to Zero". The New York Times. Retrieved November 7, 2016. ^ a b c d e f g h i j "New York City Transit - History and Chronology". Metropolitan Transportation Authority. Archived from the original on January 8, 2014. Retrieved March 12, 2007. ^ Oser, Alan S. (September 6, 1987). "PERSPECTIVES: New Homes in the Bronx; Following in Webb & Knapp's Footsteps". The New York Times. Retrieved November 7, 2016. ^ "A New Big Power House; Third Avenue Railroad Company to Build an Immense Plant; To Supply Entire System; Will Be Situated at Ninth Avenue and the Harlem River and Will Be the Largest Known" (PDF). The New York Times. January 15, 1899. Retrieved November 7, 2016. ^ "Kingsbridge Power Station of the New York City Railway Company". The Engineering Record. McGraw Publishing Company. 50 (1): 10–14. July 2, 1904. Retrieved November 7, 2016. ^ "New Power-House Plans Filed" (PDF). The New York Times. January 13, 1901. Retrieved November 7, 2016. ^ Harding, Burcham (March 22, 1900). "The Kingsbridge Power Station of the Third Avenue Ry., New York City". Engineering News-Record. McGraw Publishing Company. 43 (12): 189–191. Retrieved November 7, 2016. ^ "Inwood's Kingsbridge Power House: Manhattan on a Nickel". MyInwood. Retrieved November 7, 2016. ^ Rein, Lisa; Ratish, Robert (October 3, 1996). "NEW BUS A REAL STRRRETCH". Daily News (New York). Retrieved December 17, 2015. ^ "A Local Law to Co‐Name 18 Thoroughfares and Public Places in New York City" (PDF). nyc.gov. New York City Council. April 2, 2009. Archived from the original (PDF) on December 21, 2016. Retrieved September 18, 2016. ^ a b c d Gray, Christopher (March 22, 1992). "The New York Coliseum; From Auditorium To Bus Garage to ..." The New York Times. Retrieved September 5, 2009. ^ a b c d e f Lowell, Dana M.; Parsley, William; Bush, Christopher; Zupo, Douglas (August 24, 2008). "Comparison of Clean Diesel Buses to CNG Buses". MTA New York City Transit Authority. Retrieved December 15, 2015. ^ a b c "Transit Firm Buys Coliseum in Bronx" (PDF). The New York Times. April 16, 1946. Retrieved September 18, 2016. ^ a b "Auction Sale of Old Trolley Barns To Mark End of Surface Car Era: Third Avenue Transit to Put Buildings Worth $8,000,000 on Block in Fall as Result of Shift to Buses" (PDF). The New York Times. July 15, 1946. Retrieved September 18, 2016. ^ "Bronx Bus Service Linked To 10C Fare: Surface Line Tells the P.S.C. of Its Rehabilitation Plans-Overloading Is Cut" (PDF). The New York Times. March 17, 1950. Retrieved September 18, 2016. ^ New York Supreme Court. p. 61. Retrieved September 18, 2016. ^ Mancuso, Rich (March 20, 2007). "It's a pug's paradise". Daily News (New York). Retrieved September 18, 2016. ^ a b c d Golden, John (May 7, 2015). "Yonkers to New York City: We'll take MTA property". Westfair Communications. Retrieved September 21, 2016. ^ a b c d e "Agenda; City Council of the City of Yonkers; Stated Meeting; Tuesday, April 28, 2015". Yonkers City Council. April 28, 2015. pp. 17–18. Retrieved September 21, 2016. ^ a b "ALEXANDER STREET URBAN RENEWAL AREA". City of Yonkers. November 2008. Retrieved January 10, 2017. ^ "Report of the Westchester County Park Commission: 1927". Westchester County Park Commission. April 30, 1927. Retrieved January 10, 2017. ^ "Conductor Falls Under Train, Dies". Yonkers Herald Statesman. Fultonhistory.com. July 22, 1955. p. 1. Retrieved January 10, 2017. ^ a b c Bultman, Matt (July 20, 2012). "Schumer To MTA: Make Way For Yonkers Waterfront Development". Yonkers Daily Voice. Yonkers, New York. Retrieved September 21, 2016. ^ Garcia, Ernie (April 14, 2015). "Yonkers considers seizing bus depot land". The Journal News. Retrieved September 21, 2016. ^ Adams Otis, Ginger (April 1, 2017). "MTA bus depot staffers move to ditch current union, create new one". New York Daily News. Retrieved 28 August 2018. ^ a b c "Big Bus Garage Opens: $10,792,000 Plant Can Store 311 Vehicles and Service 2,000" (PDF). The New York Times. December 18, 1950. Retrieved October 23, 2016. ^ a b c d Branford Electric Railway Association (September 29, 2008). Brooklyn Streetcars. Arcadia Publishing. ISBN 978-1-4396-2045-8. ^ "East New York Central Maintenance Facility (MTA-NYCT): Draft Upland Site Summary" (PDF). Newtowncreek.info. May 2012. Retrieved October 22, 2016. ^ Linder, Bernard (February 2006). "Fulton Street Subway". New York Division Bulletin. Electric Railroader's Association. 49 (2): 2. Retrieved August 27, 2016. ^ a b c Casey, Leo (October 30, 1956). "NYCTA 1956 Press Release" (PDF). New York City Transit Authority. Retrieved September 1, 2016. ^ a b "City Trolley Cars Near End of Line: Transit Agency to Switch to Buses on Last 2 Runs in Brooklyn in Fall" (PDF). The New York Times. April 20, 1956. Retrieved September 5, 2016. ^ Kennedy, Randy (March 15, 2000). "Out of Touch In the City's Canyons; Satellites Become Blind Eyes in the Sky Trying to Spot and Track Buses". The New York Times. Retrieved December 17, 2015. ^ Fertig, Beth (October 10, 2007). "MTA Turns to GPS for Keeping Buses On Time". New York, New York: WNYC. Retrieved December 19, 2015. ^ "Capital Program Oversight Committee Meeting: October 2015" (PDF). Metropolitan Transportation Authority. October 2015. Archived from the original (PDF) on December 22, 2015. Retrieved December 19, 2015. ^ "Railroad Y. M. C. A. for B. R. T. Co's Men". Brooklyn Daily Eagle. Brooklyn, NY. January 19, 1902. p. 48. ^ "May Close Bergen Beach During Season of 1902". Brooklyn Daily Eagle. Brooklyn, NY. March 18, 1902. p. 20. ^ "Conductors Not to Blame". Brooklyn Daily Eagle. Brooklyn, NY. November 8, 1902. p. 20. ^ Shilling, Erik (March 6, 2009). "BUSES GET A 'SHIELD' FOR DRIVERS". Daily News (New York). Retrieved January 18, 2016. ^ Press Release (December 18, 2008). "NYCT, TWU Issue Proposals For Increased Bus Operator Safety: Policy Changes Come in Wake of Murder of Bus Operator Edwin Thomas". New York: Metropolitan Transportation Authority. Retrieved January 18, 2016. ^ Neuman, William (December 18, 2008). "Driver-Protection Partitions to Be Tested on Buses". The New York Times. Retrieved January 18, 2016. ^ Hiatt, Anna (December 20, 2011). "Murder on the B46: Three Years Gone". The Brooklyn Ink. Retrieved January 18, 2016. ^ a b c "REMEDIAL INVESTIGATION/FEASIBILITY STUDY NEWTOWN CREEK: NYCT Fresh Pond Depot Draft Upland Site Summary" (PDF). Anchor QEA, LLC. August 2012. Retrieved March 21, 2016. ^ a b "A Reader Clarifies Location Of Old Trolley Car Crossing". Times Newsweekly. July 31, 2003. Archived from the original on September 12, 2015. Retrieved March 21, 2016. ^ a b Harold, Donald W.; Berger, Raymond R. (October 2007). "October 15, 1939: 69th Anniversary of the Opening of LaGuardia Airport". New York Division Bulletin. Electric Railroaders Association. 50 (10): 17–18. Retrieved December 29, 2015. ^ a b c d e f "$2 Million Bus Garage to Open". Long Island Star-Journal. Fultonhistory.com. May 24, 1960. p. 14. Retrieved March 21, 2016. ^ a b c d Machtanz, Karl (January 3, 2008). "Old Trolley Yard Proved Perfect For Local Boys' Barnstorming Adventures". Times Newsweekly. Archived from the original on October 20, 2016. Retrieved September 1, 2016. ^ Marzlock, Ron (February 10, 2005). "Trolley Car School, Fresh Pond Road, Ridgewood". Queens Chronicle. Retrieved December 30, 2016. ^ a b c "Brooklyn Trolley Depots". New York Division Bulletin. Electric Railroaders' Association. 51 (6): 7. August 2008. Retrieved October 12, 2016. ^ "New Bus Line In Queens: Trolley Coaches to be Restored to a Brooklyn Street" (PDF). The New York Times. April 23, 1950. Retrieved December 27, 2015. ^ a b c d e f "New City Garage Washes and Fuels Bus in 3 Minutes" (PDF). The New York Times. July 27, 1960. Retrieved September 1, 2016. ^ a b c d "TA To Open New Bus Depot; Trolley Era to End; New Lights Will Result". Greenpoint Weekly Star. Fultonhistory.com. July 22, 1960. p. 1. Retrieved September 1, 2016. ^ a b c "Bus Garage Plan Fought". Long Island Star-Journal. Fultonhistory.com. February 5, 1959. p. 4. Retrieved September 16, 2016. ^ a b Baksh, Gloria Lisa (April 11, 2002). "Fresh Pond Bus Depot Drives Residents Mad". Times Newsweekly. Archived from the original on October 28, 2015. Retrieved December 30, 2016. ^ a b c "Top Projects Started 2003-2004: Grand Avenue Bus Depot and Maintenance Facility". construction.com. McGraw-Hill Construction. 2003. Archived from the original on August 20, 2004. Retrieved November 4, 2015. ^ a b c Lee, Michael T.; Purdy, John (April 28, 2008). "Bus Depot Sets Standard for Urban Facility Design". Metro Magazine. Retrieved October 12, 2016. ^ a b c d Goldman, Sam (December 27, 2007). "GRAND AVE. DEPOT SET TO OPEN 1/6: Board 5 Gets Details On MTA Project". Times Newsweekly. Archived from the original on September 16, 2015. Retrieved July 20, 2016. ^ a b c "Grand Avenue Maintenance and Bus Depot: Architecture and Landscape Design". di Domenico and Partners. Archived from the original on July 24, 2008. Retrieved December 15, 2015. ^ a b c McGadden, Robert D. (June 27, 1987). "For Gleason, a Suite and, Maybe, a Bus Depot". The New York Times. Retrieved December 15, 2015. ^ a b New York City Transit's Facts & Figures Celebrating 90 Years of Subway Service 1904–1994. New York City Transit. 1994. ^ "INVENTORY OF DECKING OPPORTUNITIES OVER TRANSPORTATION PROPERTIES Final Report: 6.7: TRANSIT AND RAILROAD YARDS: BROOKLYN" (PDF). nyc.gov. New York City Department of City Planning. September 2008. Archived from the original (PDF) on June 6, 2010. Retrieved August 6, 2015. ^ Linder, Bernard; Erlitz, Jeffrey (September 2000). 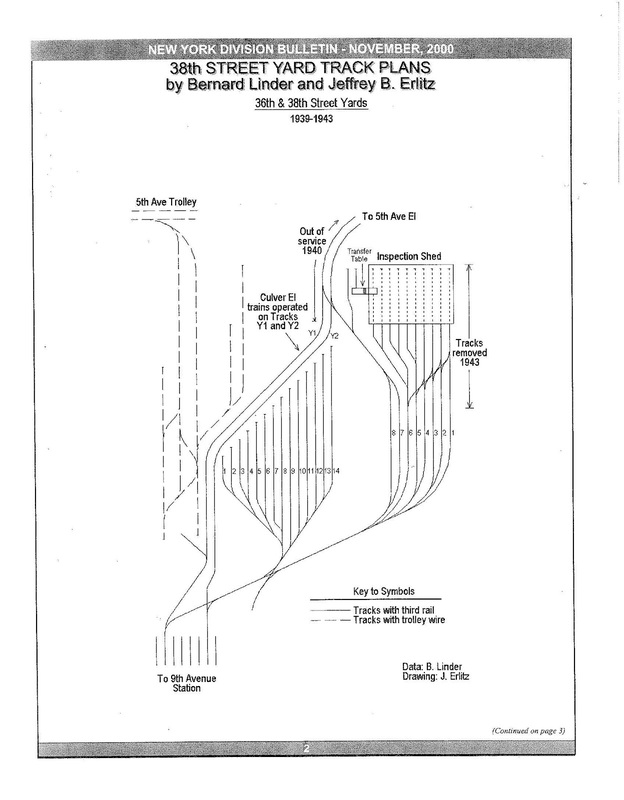 "38th Street Yard Track Plans". New York Division Bulletin. Electric Railroader's Association. 43 (9): 2. Retrieved July 26, 2016. ^ Pollak, Michael (February 8, 2004). "F.Y.I." The New York Times. Retrieved December 15, 2015. ^ Leimbach, Dulcie (April 10, 1992). "For Children". The New York Times. Retrieved December 15, 2015. ^ Pierre-Pierre, Garry (January 16, 1996). "Buses Using Natural Gas Do Well in Pilot Program". The New York Times. Retrieved December 15, 2015. ^ a b c "FIRE TACTICS AND PROCEDURES HAZARDOUS MATERIALS 1: Alternative Fuels" (PDF). New York City Fire Department. December 1, 1989. Retrieved December 15, 2015. ^ a b Eric A. Goldstein; Mark A. Izeman; Natural Resources Defense Council (1990). The New York Environment Book. Island Press. ISBN 978-1-55963-018-4. ^ Wald, Matthew L. Wald (July 8, 1988). "2 BUSES TO RUN ON NATURAL GAS IN EXPERIMENT". The New York Times. Retrieved December 15, 2015. ^ a b "Letter to Mayor Bloomberg RE: Natural Gas Buses". Transportation Alternatives. June 5, 2002. Retrieved December 15, 2015. ^ a b c "Route and Schedule Information". Archived from the original on September 18, 2000. ^ a b c d e "METROPOLITAN TRANSPORTATION AUTHORITY (MTA) NOTICE OF PUBLIC HEARING AND DESCRIPTION OF PROJECTS" (PDF). New York City: Metropolitan Transportation Authority. June 27, 2007. Archived from the original (PDF) on September 29, 2007. Retrieved November 4, 2015. ^ a b "Remembering 9/11 Through Express Coach 2185". Metropolitan Transportation Authority. September 10, 2013. Retrieved October 31, 2015. ^ Pollak, Michael (May 21, 2006). "F.Y.I. : Stonehenge in the City". The New York Times. Retrieved September 1, 2016. ^ "The Neighborhoods of Brooklyn". The New York Times. ^ a b c d e f "MTA Bus Depots In New York City" (PDF). West Harlem Environmental Action. October 13, 2006. Retrieved September 6, 2016. ^ a b c d Luo, Michael (February 15, 2004). "M.T.A. May Back Out of Plan to Convert Diesel Bus Depot". The New York Times. Retrieved September 6, 2016. ^ a b "Hybrid-Electric Transit Buses; NYCT Diesel Hybrid-Electric Buses: Program Status Update" (PDF). United States Department of Energy, National Renewable Energy Laboratory. December 2001. Retrieved September 6, 2016. ^ a b Katz, Ralph (May 12, 1962). "City Acts To Take Last Bus Garage: Condemnation of 132d St. Building is Authorized" (PDF). The New York Times. Retrieved September 6, 2016. ^ Press Release (November 29, 2005). "Orion Hybrid/Electric Buses Are Key To Cleaner Air And Improved Economy". Metropolitan Transportation Authority. Retrieved December 24, 2015. ^ Wald, Matthew L. (February 8, 1999). "Hybrid Bus Is Environmentally Friendly". The New York Times. Warren, Rhode Island. Retrieved December 26, 2015. ^ Chan, Sewell (March 28, 2005). "City to Buy Diesel-Electric Buses, Not Natural Gas Ones". The New York Times. Retrieved September 6, 2016. ^ a b "Final Scoping Document No. 7 Subway Extension -- Hudson Yards Rezoning and Development Program CEQR No. 03DCP031M Draft Generic Environmental Impact Statement (DGEIS)" (PDF). nyc.gov. New York City Department of City Planning. 2003. Archived from the original (PDF) on March 4, 2016. Retrieved November 1, 2015. ^ a b c "Western Rail Yard: Final Environmental Impact Statement; Chapter 3: Land Use, Zoning, and Public Policy" (PDF). nyc.gov. Metropolitan Transportation Authority, New York City Planning Commission. October 2009. Retrieved November 5, 2016. ^ a b "Far West Midtown: A Framework for Development" (PDF). New York City Department of City Planning. 2001. Retrieved November 6, 2016. ^ a b c d e f g Porterfield, Byron (April 27, 1966). "News of Realty: New Bus Garage; Greyhound Starts Work on Major West Side Facility" (PDF). The New York Times. Retrieved November 6, 2016. ^ a b c Dunlap, David W. (August 24, 1997). "The Taming Of the 'Wild West'". The New York Times. Retrieved November 6, 2016. ^ "Contact Us". NBC New York. ^ Daly, Michael (December 15, 2002). "QUILL MIGHT BE SMILING ON TOUSSAINT". Daily News (New York). Retrieved September 8, 2016. ^ a b c d e "Metropolitan Transportation Authority; Annual Report: 2009" (PDF). Metropolitan Transportation Authority. Retrieved September 6, 2016. ^ "CLINTON/HELLS KITCHEN NEIGHBORHOOD TRAFFIC STUDY FINAL REPORT APRIL 2014" (PDF). nyc.gov. New York City Department of Transportation. April 2014. Retrieved November 1, 2015. ^ a b c d e f g h i Hoang, Anhthu; Cadore, Yolande (2014). "The Greenest, Cleanest Depot Possible: Rebuilding the Mother Clara Hale Depot" (PDF). West Harlem Environmental Action. Retrieved September 6, 2016. ^ Andre Carrington (July 2011). Driving a Bus in New York City. Xlibris Corporation. pp. 28–30. ISBN 978-1-4653-3586-9. Retrieved March 29, 2016. ^ a b c Bernstein, Emily M. (October 24, 1993). "Neighborhood Report: Harlem; Bus Drivers Pay Tribute to the Memory of Mother Hale". The New York Times. Retrieved November 4, 2015. ^ a b c d Ranson, Jan (October 27, 2014). "The nation's first green bus depot will open next month in Harlem". Daily News (New York). Retrieved September 6, 2016. ^ "MTA - news - MTA Celebrates Re-opening of Mother Clara Hale Depot With Ribbon-Cutting". ^ a b c Kugel, Seth (August 24, 2003). "NEIGHBORHOOD REPORT: EAST HARLEM; A Bus Depot Will Reopen, And Residents Worry". The New York Times. Retrieved April 27, 2010. ^ a b c d Baker, Al; Moynihan, Colin (January 13, 2009). "Bus Drivers in Queens Are Mourning the Loss of a Colleague Fatally Shot". The New York Times. Retrieved October 29, 2015. ^ "Contact Information". Archived from the original on March 2, 2001. ^ a b Forgeron, Harry V. (March 20, 1966). "Queens Bus Garage Stresses Efficiency" (PDF). The New York Times. Retrieved October 17, 2015. ^ "Red Bus Vanishes; Police Hunt 11 Hrs". Wave of Long Island. Fultonhistory.com. September 15, 1949. p. 10. Retrieved January 10, 2016. ^ a b c "The MTA 2006 ANNUAL REPORT: Comprehensive Annual Financial Report for the Year Ended December 31, 2006 Comprehensive Annual Financial Report for the Year Ended December 31, 2006" (PDF). Metropolitan Transportation Authority. May 1, 2007. Retrieved December 28, 2015. ^ a b "Capital Program Oversight Committee Meeting: October 2012" (PDF). Metropolitan Transportation Authority. October 2012. Archived from the original (PDF) on November 2, 2013. Retrieved January 24, 2016. ^ "Jamaica Buses To Inaugurate New Service: Ceremony Will Be Held Tomorrow in Opening Routes to Southeast". Brooklyn Daily Eagle. November 10, 1933. Retrieved October 13, 2015 – via Newspapers.com. ^ a b c "Police Academy – College Point, Queens FEIS CHAPTER 7: HAZARDOUS MATERIALS" (PDF). nyc.gov. New York City Police Department. Retrieved October 16, 2015. ^ "Welcome to Queens Surface Corp!". Archived from the original on April 3, 2005. ^ a b c For Release (April 7, 2006). "Trillium Expands New York City Operations: New Contract Signed with MTA Bus Company". Integrys Energy Group. Salt Lake City, Utah. Retrieved March 2, 2016. ^ a b "MTA Bus: College Point Pick Glossary; Effective: 09/04/2016". MTA Bus Company. 2016. Retrieved August 6, 2016. ^ Pozarycki, Robert (March 6, 2014). "A WINTER OF DISCONTENT". Times Newsweekly. Archived from the original on September 6, 2015. Retrieved October 29, 2015. ^ Lyons, John (October 6, 2014). "Testimony of John Lyons President/ Business Agent, Amalgamated Transit Union Local No. 1179 Chair, ATU Legislative Conference Board The City Council Committee on Transportation Council Member Ydanis Rodriguez, Chair October 6, 2014, 12:45 p.m" (PDF). coreybearak.com. Amalgamated Transit Union Local No. 1179. Retrieved October 29, 2015. ^ a b "Analysis of Routes and Ridership of a Franchise Bus Service: Green Bus Lines" (PDF). utrc2.org/. City College of New York. October 2000. Retrieved September 30, 2015. ^ a b c d e Bockmann, Rich (April 18, 2014). "MTA buys land to redevelop aging Jamaica Bus Depot". Times Ledger. Retrieved October 29, 2015. ^ "Bus Service Plant Opens". Brooklyn Daily Eagle. August 18, 1940. p. 12. Retrieved December 17, 2015 – via Newspapers.com. ^ "CITY TAKES OVER BUS LINE: O'Connor Selected to Operate North Shore System" (PDF). The New York Times. March 30, 1947. Retrieved March 27, 2016. ^ "120-Passenger Vehicles Added For Next Week: 10 City Lines Will Have All New Equipment by Wednesday". Fultonhistory.com. Long Island Star-Journal. December 31, 1948. p. 2. Retrieved January 9, 2016. ^ "Major Improvements Ordered in Zone D". Long Island Star-Journal. Fultonhistory.com. April 10, 1947. p. 2. Retrieved February 19, 2016. ^ "Building Plan Filed" (PDF). The New York Times. May 4, 1951. Retrieved December 17, 2015. ^ James, Karen (December 21, 2006). "New buses roll into Ozone Park & Howard Beach". Qns.com. Queens Courier. Retrieved November 10, 2015. ^ Rafter, Domenick (October 24, 2013). "CB 9 articulates ire on articulated buses". Queens Chronicle. Retrieved October 29, 2015. ^ a b "New Building: Triboro Moves Offices". Long Island Star-Journal. Fultonhistory.com. January 14, 1954. p. 27. Retrieved March 5, 2016. ^ a b Gentilviso, Richard (April 19, 2004). "Two Firefighters Honored At Borough Cabinet". Queens Gazette. Retrieved November 1, 2015. ^ Wald, Matthew L. (May 17, 1989). "BUSINESS TECHNOLOGY; When Methanol Is in the Tank". The New York Times. Retrieved December 15, 2015. ^ Clark, Nigel N.; Boyce, James A. (August 21, 1998). "Exhaust Emissions Testing Performed for Air Products Corporation on Transit Buses Fueled by Air Products Brand Methanol Fuel" (PDF). West Virginia University. Retrieved December 15, 2015. ^ Motta, Robert; Norton, Paul; Kelly, Kenneth; Chandler, Kevin; Schumacher, Leon; Clark, Nigel (October 1996). "Alternative Fuel Transit Buses: Final Results from the National Renewable Energy Laboratory (NREL) Vehicle Evaluation Program" (PDF). United States Department of Energy. Retrieved December 16, 2015. ^ a b Wohlwend, Lynn (April 13, 2006). "Flames, Smoke Erupt At Triboro Coach Depot". Queens Chronicle. Retrieved October 17, 2015. ^ Fenner, Austin (April 11, 2006). "EXPLOSION, FIRE RIP BUS DEPOT". Daily News (New York). Retrieved October 17, 2015. ^ a b "MTA Bus: LaGuardia Pick Glossary" (PDF). lgaunion.com. MTA Bus Company. January 3, 2016. Archived from the original (PDF) on March 2, 2016. Retrieved March 2, 2016. ^ a b "MTA Bus: LaGuardia Depot Pick Glossary; Effective: 09/04/2016" (PDF). MTA Bus Company. 2016. Archived from the original (PDF) on August 7, 2016. Retrieved August 7, 2016. ^ a b c d Schuman, Wendy (November 26, 1972). "Queens Bus‐Garage Plan Is Protested". The New York Times. Retrieved November 7, 2016. ^ "Queens Bus Garage Planned" (PDF). The New York Times. July 16, 1968. Retrieved November 7, 2016. ^ a b c "Furor Rages Over Q.V. Bus Garage Debut Set For Sept. 8" (PDF). Creedmoor Civic Association. Queens Village, Queens. September 1974. Retrieved November 7, 2016. ^ a b c "Buses - A Plague on All Our Houses and Now on the Pkwy" (PDF). Creedmoor Civic News. November 1974. Retrieved November 7, 2016. ^ a b Sullivan, Colleen (October 20, 1974). "Protesters Opposing Bus Garage In Queens". The New York Times. Retrieved November 7, 2016. ^ Bashinsky, Ruth (July 14, 2002). "RELIVING RICH PAST OF QUEENS VILLAGE Once a thriving retail district". New York Daily News. Retrieved November 7, 2016. ^ a b Associated Press (April 18, 1979). "Radar to be tried in bus monitoring". Gannett Westchester Newspapers. New York. Retrieved November 7, 2016. ^ a b Dornfield, S. (1980). "QUEENS VILLAGE: A QUANTUM JUMP IN BUS CONTROL/COMMUNICATIONS (NEW YORK CITY)". Institute of Electrical and Electronics Engineers, SAE International. Retrieved November 7, 2016. ^ Davies, Peter; Hill, Chris; Emmott, Neil; Siviter, Jeremy (July 1991). "Assessment of Advanced Technologies For Transit and Rideshare Applications; Final Report; NCTRP Project 60-1A" (PDF). Transportation Research Board, National Research Council (United States), Urban Mass Transit Administration, United States Department of Transportation. Retrieved November 7, 2016. ^ Vehicular Technology Society (1980). Proceedings of ... Annual Conference of the IEEE Vehicular Technology Society. The Institute of Electrical and Electronics Engineers. ^ Lyndall, J. (June 10, 1975). "BUS GARAGE COMBINES BEAUTY WITH PRACTICALITY". Fleet Owner. 70 (2): 62–70. ISSN 1070-194X. Retrieved November 7, 2016. ^ a b "Feasibility Study of the North Shore Railroad Right-of-Way Project Assessment Report March 2004" (PDF). library.wagner.edu. Office of the Staten Island Borough President, Port Authority of New York and New Jersey, URS, SYSTRA,. March 2004. Archived from the original (PDF) on October 18, 2015. Retrieved August 6, 2015. ^ a b c d "2 new Staten Island bus depots are on the way". Staten Island Advance. September 13, 2008. Retrieved December 16, 2015. ^ a b c d e f g h "WEST BRIGHTON BROWNFIELD OPPORTUNITY AREA" (PDF). nyc.gov. New York City Department of City Planning. March 2016. Retrieved September 6, 2016. ^ a b Engels, Mary (September 8, 2000). "SOUTH SHORE TO GET 50M CITY BUS DEPOT". New York Daily News. Retrieved October 21, 2016. ^ a b c "Ground broken for Staten Island's 3rd bus depot". Staten Island Advance. February 15, 2008. Retrieved December 16, 2015. ^ "MAYOR BLOOMBERG AND GOVERNOR PATAKI ANNOUNCE MTA WILL PURCHASE 529 NEW LOCAL BUSES FOR QUEENS, BRONX AND BROOKLYN RIDERS AND FULLY FUND NEW MTA BUS DEPOT IN STATEN ISLAND: 70% of Aging Private Bus Franchise Fleet Soon to be Replaced". nyc.gov. Office of the Mayor of New York City. September 27, 2005. Retrieved December 16, 2015. ^ "Charleston bus depot $39M away from reality", Staten Island Advance, December 14, 2007. ^ Yates, Maura (December 8, 2010). "MTA honcho spreads a little sunshine here with hints of Staten Island transit improvements". Staten Island, New York: Staten Island Advance. Retrieved December 16, 2015. ^ a b c d e Horn, Julie Abeil (November 2008). "Phase 1A Documentary Study: Meredith Avenue Bus Depot Project Site" (PDF). nyc.gov. Historical Perspectives Inc., STV Group (United States). Retrieved September 6, 2016. ^ a b Yates, Maura (May 24, 2009). "Departed MTA chief sees transit upgrades for Staten Island". Staten Island Advance. Retrieved September 6, 2016. ^ a b "REPORT OF THE NEW YORK CITY NEW YORK STATE TASK FORCE ON BUILDING AND FIRE SAFETY" (PDF). New York State Division of Homeland Security and Emergency Services. June 2012. Retrieved October 12, 2016. ^ a b c d e f g h i "Western Rail Yard: Final Environmental Impact Statement; Chapter 12: Hazardous Materials" (PDF). nyc.gov. Metropolitan Transportation Authority, New York City Planning Commission. October 2009. Retrieved September 2, 2016. ^ a b c d Gregory Butler (March 27, 2006). DISUNITED BROTHERHOODS: ...race, racketeering and the fall of the New York construction unions. iUniverse. pp. 172–173. ISBN 978-0-595-83529-4. Retrieved September 1, 2016. ^ a b c d "Coney Island Terminal of the Coney Island & Brooklyn Railroad". Electric Railway Journal. McGraw Publishing Company. 39 (19): 790–792. May 11, 1912. Retrieved September 1, 2016. ^ a b Walsh, Kevin (August 2002). "OLD STILLWELL AVE. TERMINAL — Forgotten New York". forgotten-ny.com. Forgotten NY. Retrieved August 15, 2016. ^ a b Walsh, Kevin (February 2002). "CULVER'S TRAVELS. The demolition of a Brooklyn elevated link". Forgotten New York. Retrieved September 2, 2016. ^ a b c Denson, Charles (2011). Coney Island and Astroland. Arcadia Publishing. pp. 16–17. ISBN 0738574287. Retrieved September 9, 2013. ^ a b "Culver Terminal Razed: Coney Island Gateway to Be Succeeded by Amusement Place" (PDF). The New York Times. January 14, 1923. Retrieved September 2, 2016. ^ "A Fact a Day About Brooklyn". Brooklyn Daily Eagle. Fultonhistory.com. July 26, 1939. Retrieved September 1, 2016. ^ Plan of the New Terminal Yard Arrangement For The Culver Terminal At Coney Island−Brooklyn Rapid Transit Company, Street Railway Journal, 1904. ^ Matus, Paul (May 2003). "The New BMT Coney Island Terminal". thethirdrail.net. p. 2. Archived from the original on June 29, 2013. Retrieved August 15, 2016. ^ Huneke, Arthur John. "Coney Island CULVER Terminal". www.arrts-arrchives.com. Retrieved August 15, 2016. ^ a b c "New Amusement Features of Surf Avenue; Coney Island and the Public Service Corporations". Brooklyn Daily Eagle. May 27, 1911. p. 27. Retrieved September 2, 2016 – via Newspapers.com. ^ a b c "Central Park to Get Carrousel From City to Replace Burned One" (PDF). The New York Times. December 6, 1950. Retrieved September 2, 2016. ^ a b c Johnston, Laurie (July 2, 1951). "They're Off at 11, Mayor Riding, In Central Park's New Carrousel" (PDF). The New York Times. Retrieved September 2, 2016. ^ Matus, Paul (May 2003). "The New BMT Coney Island Terminal". thethirdrail.net. p. 1. Archived from the original on October 17, 2016. Retrieved August 15, 2016. ^ a b c d "Riders on New Buses Will Triple in July". New York World-Telegram. Fultonhistory.com. May 12, 1960. pp. B1–B2. Retrieved January 10, 2016. ^ "Parking Can Be Fun, Next Year, At Coney". New York World-Telegram. Fultonhistory.com. July 25, 1962. p. B1. Retrieved September 16, 2016. ^ "People or Parking". Brooklyn World-Telegram. Fultonhistory.com. November 30, 1962. p. B2. Retrieved September 16, 2016. ^ O'Kane, Lawrence (March 1, 1965). "State Rent Plan Opens Here Today: 600 Low-Income Families Will Get Subsidy to Enter Middle-Income Housing" (PDF). The New York Times. pp. 1, 24. Retrieved September 16, 2016. ^ "Housing By The Sea". Brooklyn World-Telegram. Fultonhistory.com. March 27, 1964. p. B2. Retrieved September 16, 2016. ^ a b c Burks, Edward C. (January 26, 1971). "City Board Backs a School Site Under Flight Path to Kennedy". The New York Times. p. 65. Retrieved September 24, 2016. ^ a b c d e f Prial, Frank J. (September 10, 1972). "Bus Garage Plans Still Weighed". The New York Times. Retrieved September 9, 2016. ^ "37th Street Shop, Brooklyn, N.Y." New York Transit Museum. May 6, 1948. Retrieved September 6, 2016. ^ "Emergency Vehicle at the 39th Street Garage, Brooklyn, NY". New York Transit Museum. Retrieved September 6, 2016. ^ "37th Street Shop, Brooklyn, N.Y." New York Transit Museum. March 6, 1948. Retrieved September 6, 2016. ^ "37th Street Shop, Brooklyn, N.Y." New York Transit Museum. March 5, 1948. Retrieved September 6, 2016. ^ "Buses to Run Soon on 8th and 9th Avs". The New York Times. October 5, 1935. p. 17. ^ Katz, Ralph (March 2, 1962). "Bus Pickets Grim in Backing Strike: Lay-Offs by Company Serve to Solidify Sentiment" (PDF). The New York Times. Retrieved September 6, 2016. ^ a b Allee King Rosen and Fleming, Inc. (May 1994). Route 9A Reconstruction Project: Final Environmental Impact Statement; Appendix B: Land Use and Socioeconomic Conditions. New York State Department of Transportation, Federal Highway Administration, United States Department of Transportation. pp. B-7, B-46, B–55, B-57. Retrieved May 25, 2016. ^ "SMRT Study Mission to the U.S. & Canada May 20 – May 30, 2008" (PDF). American Public Transportation Association, Seoul Metropolitan Rapid Transit Corporation. May 2008. Retrieved September 2, 2016. ^ "WORKING IN THE DARK: IMPLEMENTATION OF THE METROPOLITAN TRANSPORTATION AUTHORITY'S CAPITAL PLAN" (PDF). Citizens Budget Commission. October 2009. Retrieved September 2, 2016. ^ Greenhouse, Steven (July 2, 1998). "Firm Singles Out by Protesters Faces Loss of Bidding Rights". The New York Times. Retrieved September 2, 2016. ^ Robbins, Tom (July 5, 1998). "A UNION OF CONSTRUCTION, PROTECTION". Daily News (New York). Retrieved September 2, 2016. ^ a b "Western Rail Yard: Final Environmental Impact Statement; Introduction" (PDF). nyc.gov. Metropolitan Transportation Authority, New York City Planning Commission. October 2009. Retrieved September 2, 2016. ^ Alexander, Ron (February 12, 1986). "METROPOLITAN DIARY". The New York Times. Retrieved December 17, 2015. ^ a b c Gartland, Michael (January 19, 2014). "MTA to move depot built on slave graveyard". New York Post. Retrieved January 19, 2014. ^ "Tunnel vision". The Economist. April 19, 2007. ^ Chan, Sewell (June 28, 2005). "Metro Briefing New York: Manhattan: M.T.A. Approves Bus Experiment". The New York Times. Retrieved December 17, 2015. ^ a b c d "Harlem African Burial Ground History and Task Force Overview" (PDF). Harlem African Burial Ground Task Force. January 2016. Retrieved September 1, 2016. ^ a b "East 126th Harlem African Burial Ground Project Site". New York City Economic Development Corporation. Retrieved September 1, 2016. ^ Dunlap, David W. (February 7, 2012). "A Depot and a Fight to Photograph the City". The New York Times. Retrieved December 17, 2015. ^ Gartland, Michael (June 22, 2014). "Bus depot to become memorial for slaves found buried there". New York Post. Retrieved December 17, 2015. ^ a b "Second Avenue Subway Final Environmental Impact Statement (FEIS): APPENDIX E.1 SOCIAL AND ECONOMIC CONDITIONS" (PDF). mta.info. Metropolitan Transportation Authority. Retrieved March 20, 2016. ^ "East 125th Street Development: 3.7 URBAN DESIGN & VISUAL RESOURCES" (PDF). New York City Economic Development Corporation. Retrieved March 21, 2016. ^ "DESIGN/BUILD BUS PARKING FACILITY 126TH STREET BUS DEPOT". Metropolitan Transportation Authority. 2002. Archived from the original on August 4, 2002. Retrieved December 30, 2016. ^ Kahn, Alan Paul (1973). The Tracks of New York Number 3: Manhattan and Bronx Elevated Railroads 1920. Seymour Durst, Electric Railroaders' Association. Retrieved October 23, 2016. ^ "Fading 'El' Station Is Closing Tonight: 129th St. Stop on 3d Ave. Line to Be Razed for Bus Garage and Other Improvements" (PDF). The New York Times. June 30, 1950. Retrieved October 23, 2016. ^ a b "Legal Notices". Brooklyn Daily Eagle. August 8, 1947. p. 14. Retrieved September 1, 2016 – via Newspapers.com. ^ "Bergen Street Trolley Coach Depot". Brooklyn Public Library. 1948. Retrieved September 1, 2016. ^ "A Look Inside MTA New York City Transit's Sign Shop". Metropolitan Transportation Authority. October 17, 2014. Retrieved September 1, 2016. ^ Paul A. Shaw (November 18, 2008). "The (Mostly) True Story of Helvetica and the New York City Subway". AIGA. aiga.org. Retrieved February 4, 2009. ^ Mocker, Greg (October 22, 2014). "NYC subway signs offer important directions and occasional misspellings". PIX 11. Retrieved September 1, 2016. ^ Rawsthorn, Alice (April 3, 2011). "New York Subway's Long Dance With a Typeface". The New York Times. Retrieved September 1, 2016. ^ New York (State). Board of Railroad Commissioners (1906). Annual Report. p. 881. Retrieved September 1, 2016. ^ American Electric Railway Association (1912). Proceedings of the American Electric Railway Association. American Electric Railway Association. p. 470. Retrieved September 1, 2016. ^ "City Subsidies to Keep 15-Cent Fare to End of 1961". Long Island Star-Journal. Fultonhistory.com. June 29, 1960. p. 23. Retrieved September 1, 2016. ^ ""Bergen Street Sign Shop" Tour: New York Transit Museum". New York Art Beat. 2008. Retrieved September 1, 2016. ^ a b "NYC Department of Sanitation Garage Locations" (PDF). nyc.gov. New York City Department of Sanitation. Retrieved September 6, 2016. ^ a b "Draft Old Buses For Commuters In S.I. Strike: Vehicle Had Been Retired and Put in Storage-Run as 'Extras'". Brooklyn Daily Eagle. Fultonhistory.com. July 24, 1934. p. 4. Retrieved September 6, 2016. ^ a b c d Platt, Tevah (September 2, 2010). "Sanitation garage cannot remain status quo". Staten Island Advance. Tompkinsville, Staten Island. Retrieved September 6, 2016. ^ a b "Last Staten Island Trolley Car Ran 70 Years Ago". New York Division Bulletin. Electric Railroaders Association. 47 (2): 1, 15. February 2004. Retrieved September 6, 2016. ^ "City Studies S.I. Bus Co. Plea for Aid". Brooklyn Daily Eagle. February 14, 1947. p. 13. Retrieved September 6, 2016 – via Newspapers.com. ^ "Tompkinsville Sanitation garage is finally going where it belongs (editorial)". Staten Island Advance. May 21, 2015. Retrieved September 6, 2016. ^ Sanders, Anna (May 14, 2015). "Jersey Street garage to get $111 million replacement at Fresh Kills". Staten Island Advance. New York City Hall. Retrieved September 6, 2016. ^ a b c d e f g h "CULTURAL RESOURCE SURVEY STAGE 1A REPORT NEWTOWN CREEK, NEW YORK: REMEDIAL INVESTIGATION/FEASIBILITY STUDY, NEWTOWN CREEK; APPENDIX XI: TABLE OF ARCHITECTURAL RESOURCES WITHIN THE BUILT ENVIRONMENT STUDY AREA" (PDF). R. Christopher Goodwin & Associates, Inc. December 2012. Retrieved October 12, 2016. ^ a b c d e f g "NYCT Crosstown Annex Facility: Draft Upland Site Summary" (PDF). Newtowncreek.info. May 2012. Retrieved October 12, 2016. ^ a b c "ENB Region 2 Completed Applications 05/02/2001". New York Department of Environmental Conservation. May 2, 2001. Retrieved October 12, 2016. ^ a b c Bergoffen, Celia J. (April 2004). "Archaeological Assessment Report - Phase 1A: Greenpoint-Williamsburg Rezoning; Part II: Lot Histories - Summary Data" (PDF). nyc.gov. New York City Department of City Planning, Philip Habib and Associates. Retrieved October 12, 2016. ^ "Real Property Reports Covering Fiscal Year 2012" (PDF). Metropolitan Transportation Authority. 2012. Retrieved March 29, 2016. ^ "A Trolley Concert: A Brilliant Affair at the Crosstown Headquarters". Brooklyn Daily Eagle. October 18, 1896. p. 7. Retrieved March 29, 2016 – via Newspapers.com. ^ a b "8-Alarm Fire In Greenpoint: Flames Sweep Two Blocks; Area Evacuated". Long Island Star-Journal. Fultonhistory.com. June 30, 1952. p. 1. Retrieved October 21, 2016. ^ "City Gets $570,000 At Brooklyn Auction" (PDF). The New York Times. September 7, 1951. Retrieved October 21, 2016. ^ a b Perlmutter, Emanuel (July 1, 1952). "1 Dead, 46 Hurt, 42 Homeless In $1,000,000 Brooklyn Fire" (PDF). The New York Times. pp. 1, 18. Retrieved October 21, 2016. ^ "Industrial Realty In Brooklyn Deals: Box Concern to Occupy Plant on Clay Street-Lease Sold on Wythe Avenue Block" (PDF). The New York Times. March 18, 1952. Retrieved October 23, 2016. ^ "Park Slope Homes In Recent Deals; Other Realty News". Brooklyn Daily Eagle. March 19, 1952. p. 29. Retrieved October 23, 2016 – via Newspapers.com. ^ Leiner, Al; Roth, Richard J.; Greenbaum, Clarence (June 30, 1952). "Biggest Blaze In A Decade Sweeps Greenpoint Homes". Brooklyn Daily Eagle. Retrieved October 21, 2016 – via Newspapers.com. ^ "8-Alarm Fire In Greenpoint: Flames Sweep Two Blocks; Area Evacuated". Long Island Star-Journal. Fultonhistory.com. June 30, 1952. p. 2. Retrieved October 21, 2016. ^ Cobb, Geoff (June 14, 2016). "A History of Greenpoint in 25 Buildings #6: The Havemeyer Sugar Refinery". Greenpointers.com. Retrieved October 12, 2016. ^ "Notice of Public Hearing". Brooklyn Daily Eagle. February 25, 1954. p. 25. Retrieved March 29, 2016 – via Newspapers.com. ^ "1976 Brooklyn Bus Map". wardmaps.com. New York City Transit Authority. 1976. Retrieved March 28, 2016. ^ a b c Goldman, Ari L. (May 3, 1982). "100 NEW G.M. BUSES SIT IDLE IN DISPUTE OVER REAR DOORS". The New York Times. Retrieved March 29, 2016. ^ "MTA New York City Transit: 2008 Final Proposed Budget; November Financial Plan 2008 - 2011" (PDF). Metropolitan Transportation Authority. 2008. Retrieved November 5, 2016. ^ a b "Finance Committee Meeting December 2015" (PDF). Metropolitan Transportation Authority. December 2015. Archived from the original (PDF) on April 8, 2016. Retrieved March 29, 2016. ^ a b Blau, Reuven (August 20, 2012). "City seeks a developer to build condos and use the profits to finance parks on north Brooklyn waterfront: Development has delayed because the city hasn't found a new location for a large MTA parking/storage lot on Commercial St. in Greenpoint". Daily News (New York). Retrieved March 29, 2016. ^ Philip Habib & Associates; Sandstone Environmental Associates (November 6, 2013). "77 Commercial Street Special Permit and Related Actions Revised Environmental Assessment Statement" (PDF). nyc.gov. Waterview at Greenpoint LLC. Archived from the original (PDF) on July 9, 2014. ^ Fraser, Lisa A. (April 12, 2011). "MTA moves one step closer to moving from Greenpoint". Queens Ledger. Retrieved March 29, 2016. ^ a b United Press International (February 19, 1983). "THE CITY; Buses in Harbor Being Retrieved". The New York Times. Retrieved September 1, 2016. ^ a b c d Gargan, Edward A. (August 19, 1981). "NO WRONGDOING FOUND IN AGENCY'S CONTROVERSIAL S.I. PIER PURCHASE". The New York Times. Retrieved September 1, 2016. ^ "MTA adds funds to improve transit stations, equipment". Yonkers Herald Statesman. Fultonhistory.com. April 30, 1983. p. 2. Retrieved September 1, 2016. ^ "Staten Island E-ZPass Customer Service Center Moving to 1150 South Ave.—Opening Feb. 9th One Edgewater Plaza CSC Closes Feb. 5th at 7 PM". Metropolitan Transportation Authority. January 30, 2009. Retrieved September 2, 2016. ^ DiMaio, Shane (October 6, 2015). "MTA informing community boards about plans for Staten Island bus study". Staten Island Advance. Staten Island. Retrieved September 2, 2016. ^ "Community Board No. 1: Staten Island, New York City". nyc.gov. Staten Island Community Board 1. Retrieved September 2, 2016. ^ Oser, Alan S. (January 30, 1980). "Conversions Changing Face of Staten Island Waterfront" (PDF). The New York Times. Retrieved September 2, 2016. ^ Johnson, Kirk (July 14, 1985). "STATEN ISLAND'S SHORE PRIMED FOR GROWTH". The New York Times. Retrieved September 3, 2016. ^ a b Doswell, John (September 24, 2003). "Pier 57's construction was an engineering marvel". The Villager. Retrieved July 16, 2009. ^ a b "PIER 57 REDEVELOPMENT PROJECT; Pier 57: Final Scope of Work for an Environmental Impact Statement" (PDF). Hudson River Park Trust; Hudson Eagle, LLC; AKRF, Inc.; Sam Schwartz Engineering. October 10, 2012. Retrieved September 10, 2016. ^ a b "PIER 57 REDEVELOPMENT PROJECT: Final Environmental Impact Statement; Chapter 7: Historic and Cultural Resources" (PDF). Hudson River Park Trust; Hudson Eagle, LLC; AKRF, Inc.; Sam Schwartz Engineering. February 22, 2013. Retrieved September 10, 2016. ^ a b Levine, Richard (February 21, 1987). "Floating Depot for Buses Is Proposed for Hudson". The New York Times. Retrieved March 29, 2016. ^ Nichols, Mary Perot (May 25, 1972). "Bus depot on Pier 57 opposed". The Village Voice. Retrieved March 29, 2016. ^ Phalon, Richard (April 7, 1972). "Groups Block Use Of Pier as Garage". The New York Times. Retrieved September 9, 2016. ^ Bamberger, Werner (September 12, 1972). "Ship Traffic Last Month Was Up Over Year Ago" (PDF). The New York Times. Retrieved March 29, 2016. ^ a b Ledbetter, James (July 28, 1998). "Rupert's Welfare". The Village Voice. Retrieved September 7, 2016. ^ a b c d "New York Post Harlem River Yard Project" (PDF). Allee, King, Rosen & Fleming, Inc. January 7, 1998. Retrieved September 7, 2016. ^ Newman, Andy (March 20, 1998). "In Deal to Sell Bus Depot, The Post Would Get a Plant". The New York Times. Retrieved September 7, 2016. ^ Bagli, Charles V. (July 21, 1998). "Post Gets $24.4 Million in Incentives to Stay in New York". The New York Times. Retrieved September 7, 2016. ^ a b c d "CROTONA TERRACE: Remedial Investigation Report" (PDF). nyc.gov. Joy Construction Corporation, Brinkerhoff Environmental Services, Inc. November 2013. Retrieved September 20, 2016. ^ a b c "Crotona Park to see new retail complex". Real Estate Weekly. AllBusiness.com. May 22, 2002. Archived from the original on September 30, 2007. Retrieved September 20, 2016. ^ a b c Egbert, Bill (May 22, 2002). "12-SCREEN CINEMA FOR WEST FARMS DEPOT". Daily News (New York). Retrieved September 20, 2016. ^ "SoBro 1825 Boston Road" (PDF). nyc.gov. Bronx Borough president. Archived from the original (PDF) on November 30, 2016. Retrieved September 20, 2016.